Ok I'm trying something a bit more different this time. A bit more different but also normal, as in keeping it simple. If you're curious and load any of the attached .sav files use the custom layout in the galaxy map. I've underlined the most important bits. -Cross planetary waves are going to make the quite a bit different. 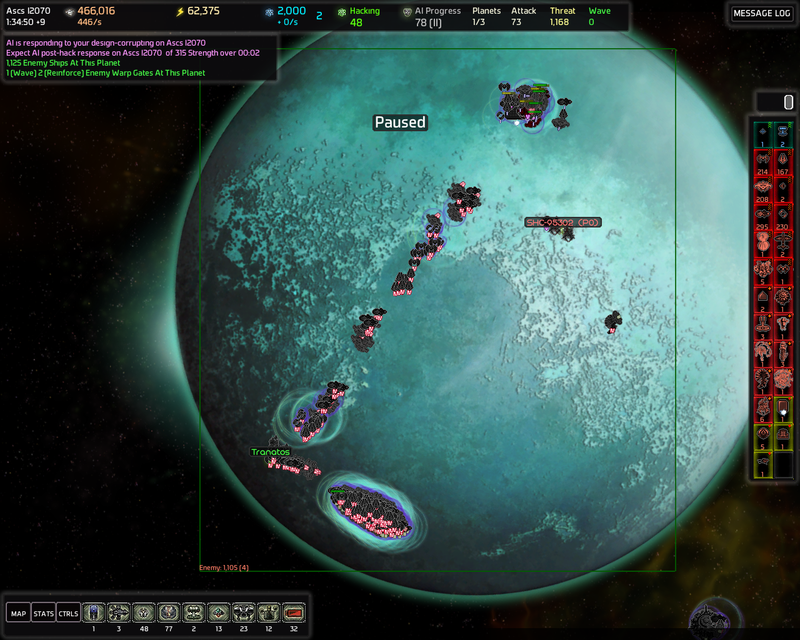 The AI isn't going to waste as many ships since all waves are basically just threat and they wont attack unless they have superiority in firepower. And since they're threat and wont be wasted like normal waves are AI is more likely to abuse weak points in my defenses. -Raid Engine Vengeful is going to get angry whenever I destroy anything (including Raid Engines (in addition to the AIP raise)). -Vanguard has literally dozens of guardians on many of it's planets so alarming those is to be avoided. Especially if any of the nearby planets have EMP Guardians. 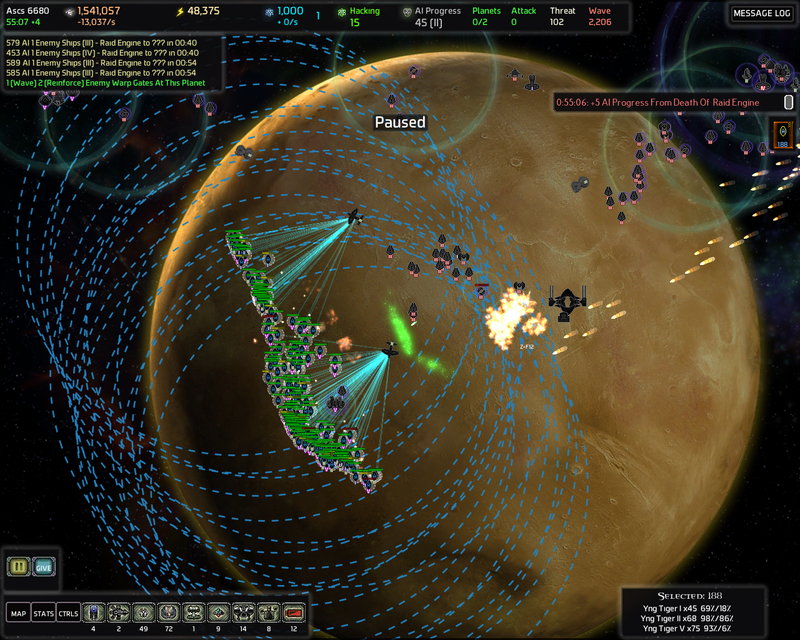 -And speaking of EMP Guardians, I've set Preemptive to 10/10 for both AIs. Which means in addition to everything there's also going to be EMP Guardians just roaming around. -Both AIs also have Hunter plot at 7/10 which means their Special Forces are going to be big enough. It also means that I do not want to a Special Forces Alarm Post to catch me.. Or maybe I do, but only in the end game when I'm about to attack the AI homeworlds. But that's not going to happen in a while. 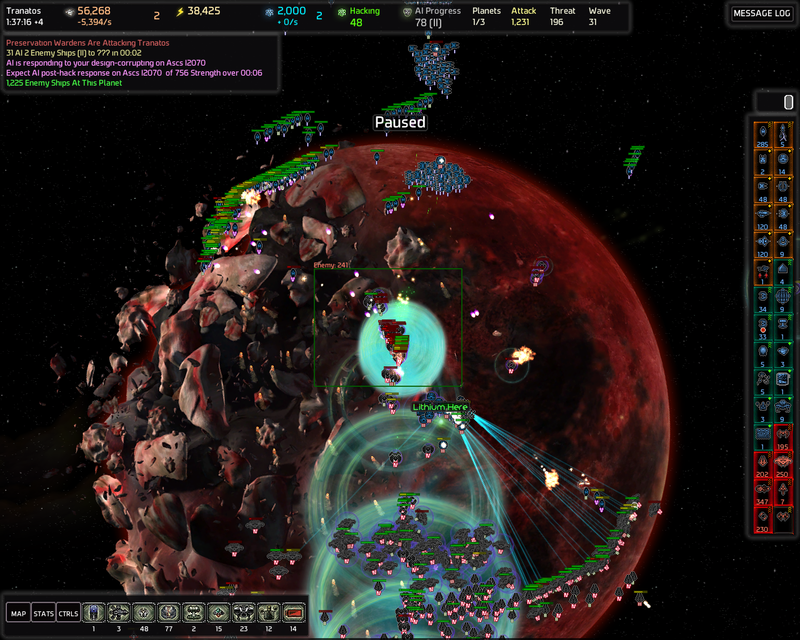 -Starships are disabled so no need to stress about AI Plasma Siege Starships. Also no Raid Starships for me to destroy Raid Engines with so that should a fair deal. No Mark II Flagships to boost those Neinzul Tigers either. 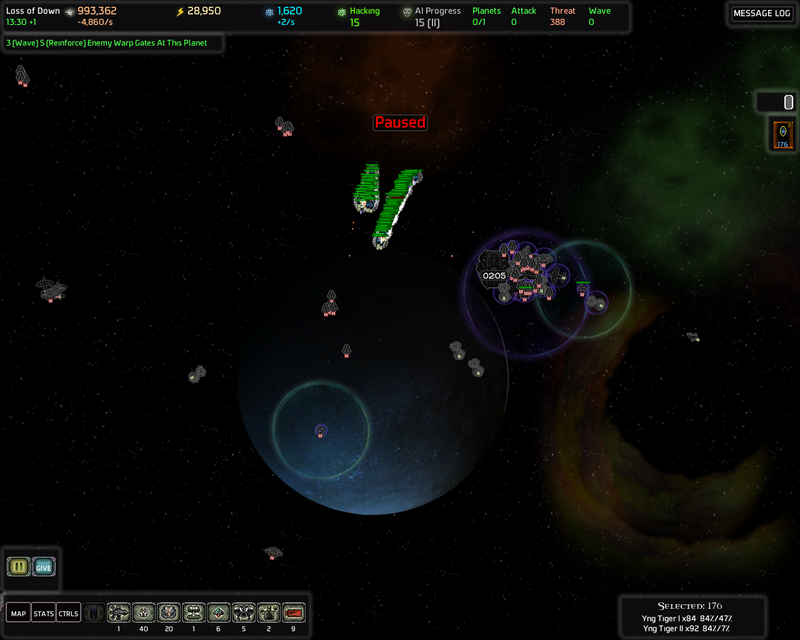 Edit: Also no Cloaker Starships for me to cloak Warheads with, that's a bummer. 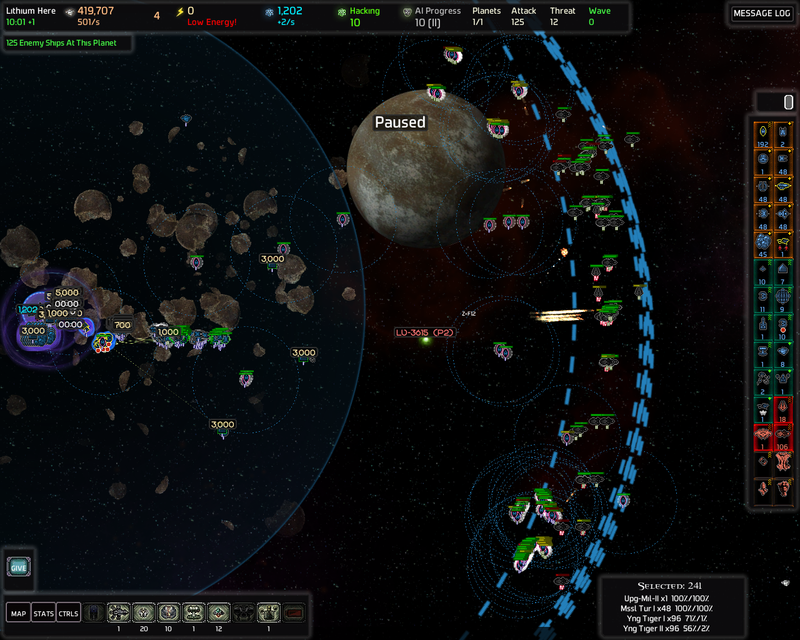 My strategy for this game is to get Mark IV Neinzul Tigers (my bonus ship) by hacking an Advanced Factory. 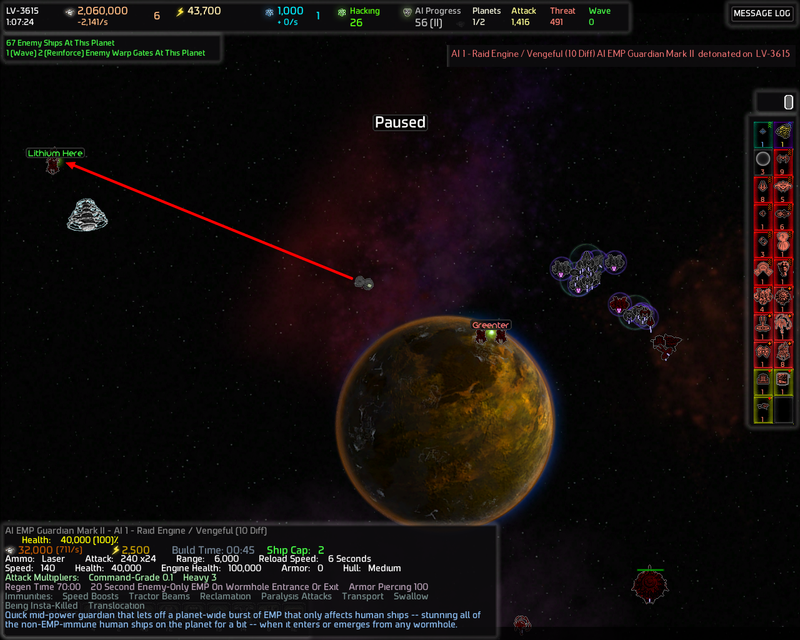 I'm going to unlock Mobile Space Docks from the get go so I can spam those Tigers. Defense is going to be handled by Mark III Military Command Stations, NTiger spam, high Mark levels of Missile Turrets and Sniper and Spider Turrets. Gravitational Turrets are also going to be abused. In other words. 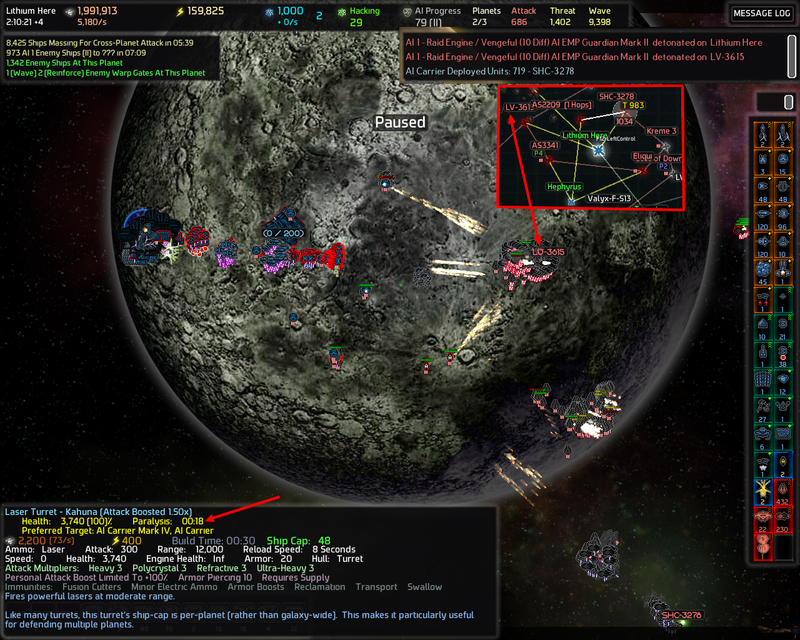 Spam a lot of NTigers, knock the AI's ships away with the Military Command Station, destroy their engines and finally destroy them. First techs. 0 Knowledge left (+3000 incoming). Now off to build, scout and "netflix" for a little bit. 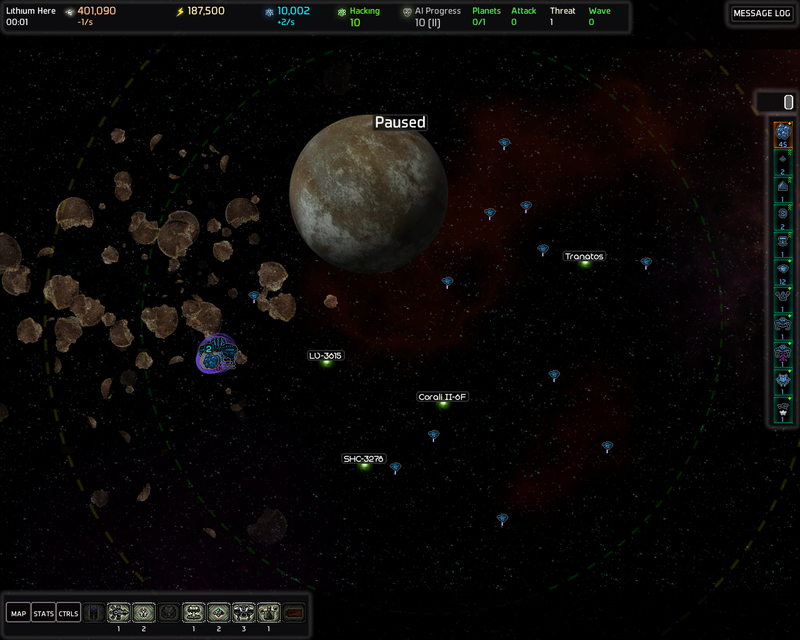 Surroundings are scouted and time to neuter some of the adjacent planets. Full caps of Mark I and II NTigers build in 9 seconds with the MSDs. Got my dose of cryptonite right from the get go. All of them are Mark IV too. And the Cross Planetary waves.. there's going to be a lot of threat like that hanging around. 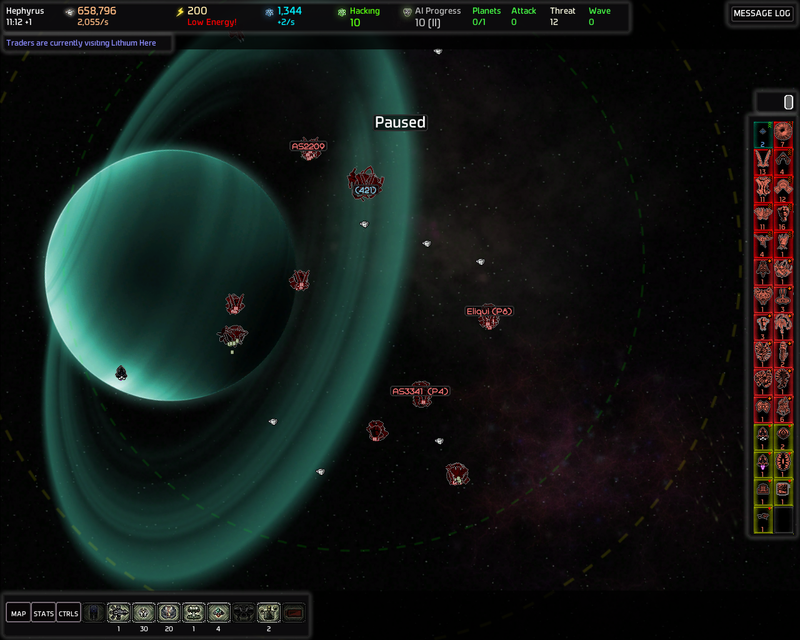 A Tractor Guardian dragged some of my NTigers to an unscouted planet and triggered 2 more Raid Engines. Yeah this started really smoothly. They have arrived. My strategy works very well. 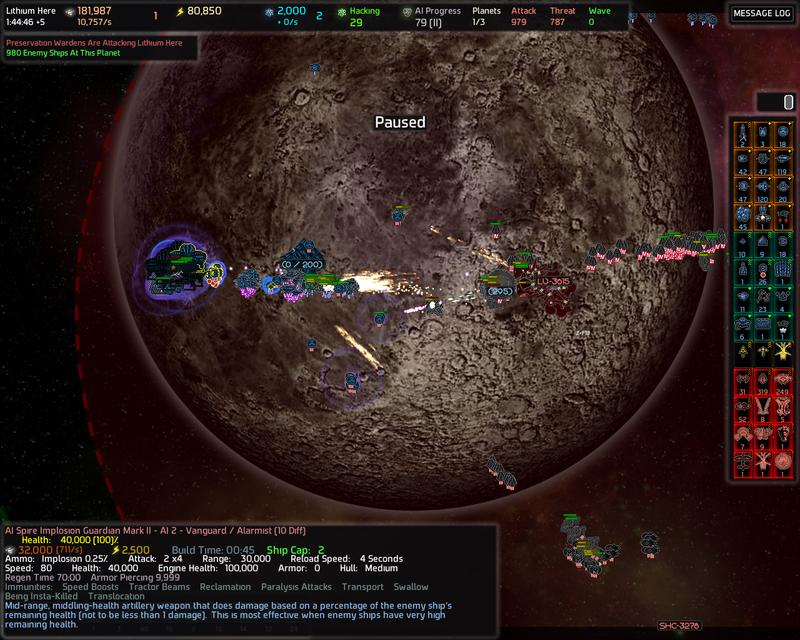 Mil CS knocks the ships away even if they're protected by Shield Bearers. Thank lord. 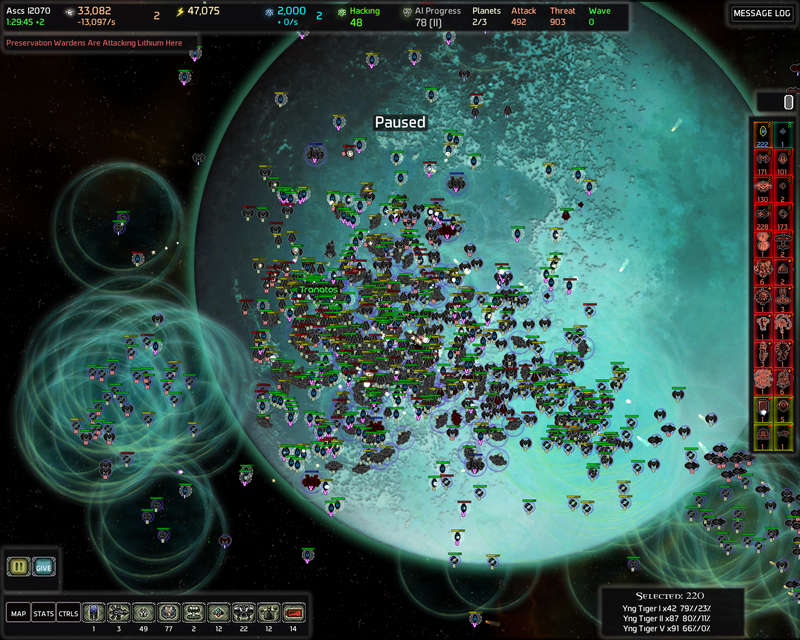 That's 195 AI ships disabled by the Military Command Station which is roughly 40% of the total number of AI forces currently attacking. Time to clean up. Only a couple of them got away. Ton of Guardians. 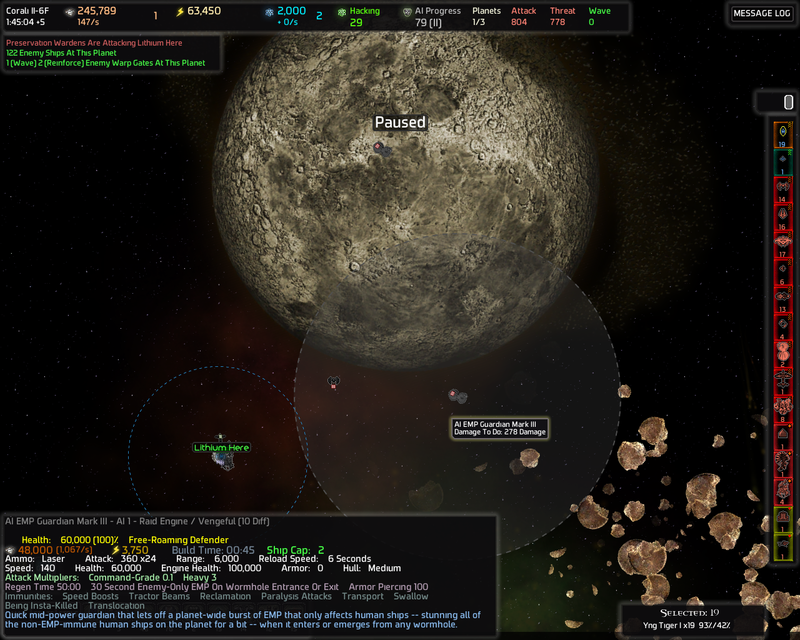 Here's a good example of Vanguard's planet..
..and speaking of good. See those Fabricators? Well there's more..
Wow.. There are no words to describe the amount of luck I had with this seed. No I didn't check this map with full visibility beforehand so this came as a pleasant surprise. This starting position is basically a very specific kind of a dream for Super Cat. Hacking all of those is going to save me HUUUGE amounts of knowledge. If I now got a Zenith Power Generator I'd have already won the game. 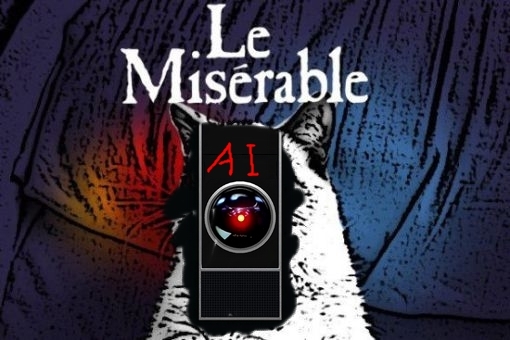 The AI just wouldn't know it yet. I think I have good chances even without the Zenith Generator. 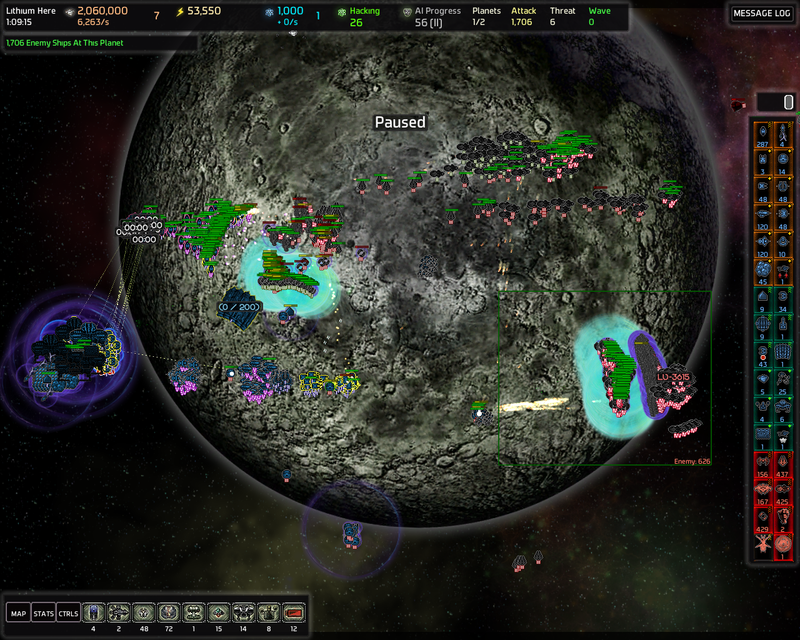 The P6 planet in the lower right corner has a Shield Bearer Database which I'm going to sabotage at some point. I really want to get all of those three Fabricators before the first CPA. Now I need to strategize for a bit. Ok here's my plan. First I'm going to destroy the Raid Engine pointed by the red arrow and then I'm going to go as the blue arrows show and capture Hephyrus. I thought of capturing AS3341 (P4 with Co-Processor) and then hacking both of the planets from there but capturing AS3341 would increase the AIP by 45 which is way too much. 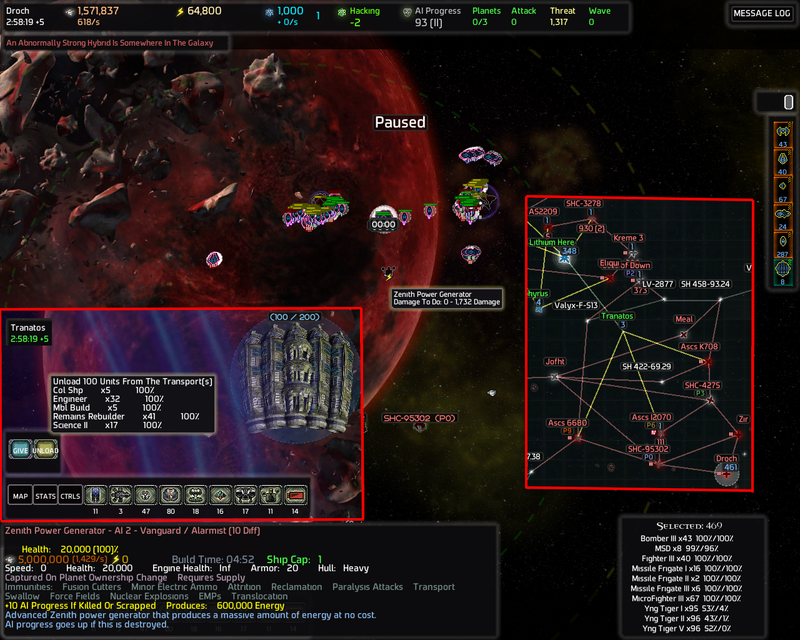 It has an Alarm Guard Post and a Co-Processors which is 5+20 AIP and of course 5+15 from the Warp Gate and the Command Station. So. I'm going capture Hephyrus (The one with Mark V NTigers and Sniper Turrets) instead of hacking it. 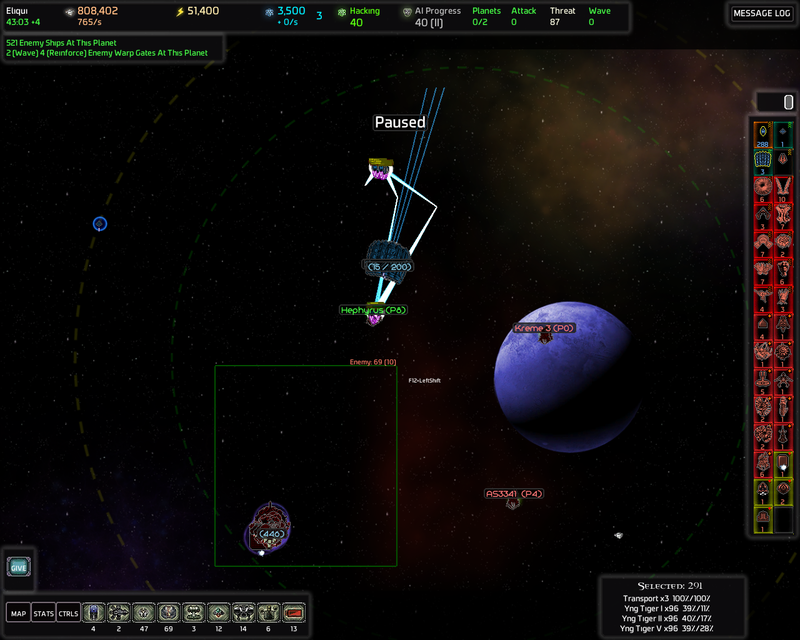 The fabricators are together on the edge of the area so it's a perfect place for the style of defense I'm going with now. What really sacres is Loss of Down with it's 6 EMP Guardians. If those things become threat I'll have to try to hunt them down with MSDs and NTigers ASAP. I'm going to have to destroy that Raid Engine at some point anyway. I'm going to try to destroy both Raid Engines at once since the AIP is still 10. It's better to trigger multiple Raid Engines at 10 AIP than at 15, 20 or so. I put the NTigers on stand down mode so they're loaded when they get in range of the Raid Engine. Also put MSDs on stand down mode so they stay cloaked and also brought them in to spam more NTigers when needed. 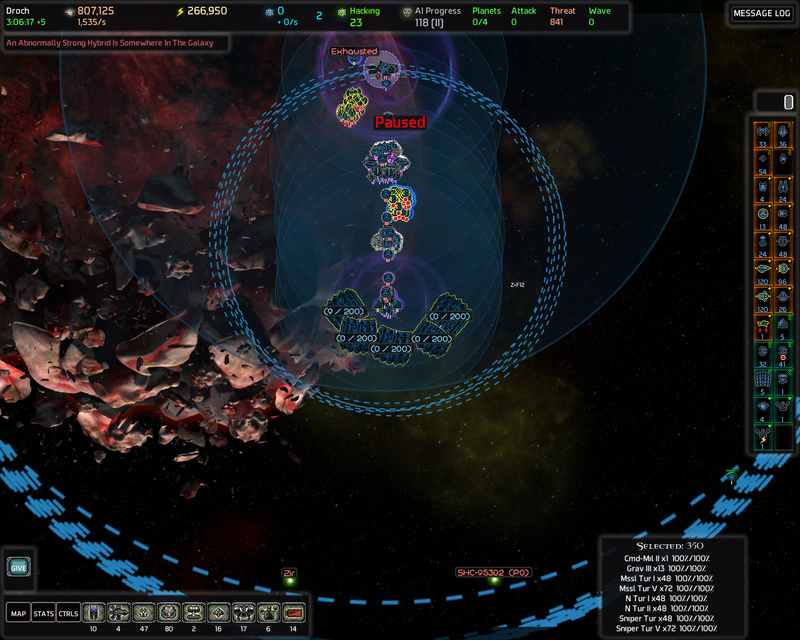 Then shift clicked to the Tachyon Guardian on Loss of Down's wormhole and then the Wormhole itself. MSDs will follow after the Tachyon Guardian on the other side is destroyed. And sure enough I alerted all of the 6 EMP Guardians. 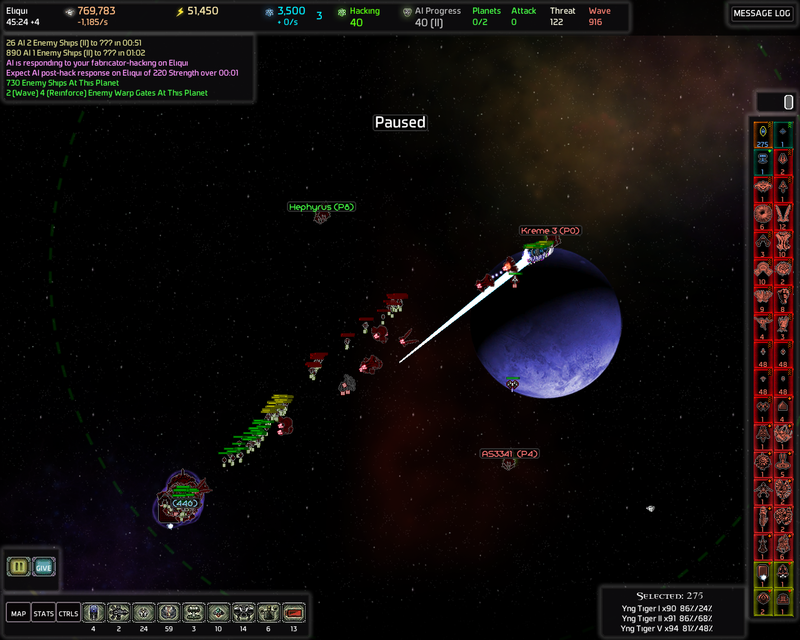 There's a seventh EMP Guardians on Kreme 3 heading towards my homeworld. Will have to focus on defending now and do another run. Ok now they're all heading for my head. Aaaand I died shortly after because they didn't all arrive at once. They arrived one by one over the course of a couple of minutes. Which means I was EMPd for several minutes. 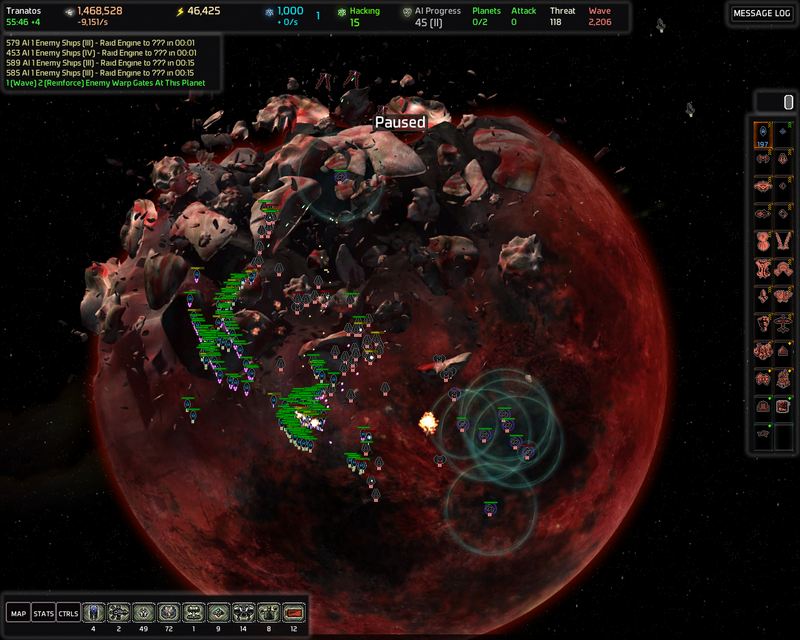 And then the AI ships just flied next to my Home Command Station and *pop*. 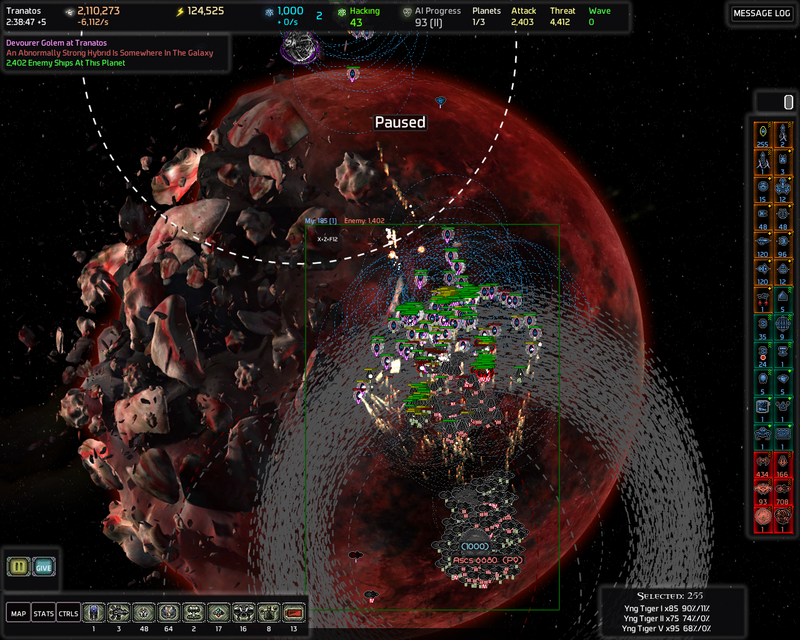 Thanks to the additional Gravitational Turrets I built in preparations for this I would have survived 3 consecutive EMPs. But 6 or 7? .. Going to do things a bit differently. I'm going to camp on AS2209 (After neutering it) with my MSDs and when the AI attacks I keep sending NTigers from there since it's not going to get EMPs because it's not on their route. I'm also not going to alert Loss of Down at this time. Ok survived the fallout this time and am attacking Hephyrus now. This is going to be tough. Alerted all of the Guardians and I also destroyed the Barracks. Luckily there were no EMP Guardians. I think my defenses can handle this. 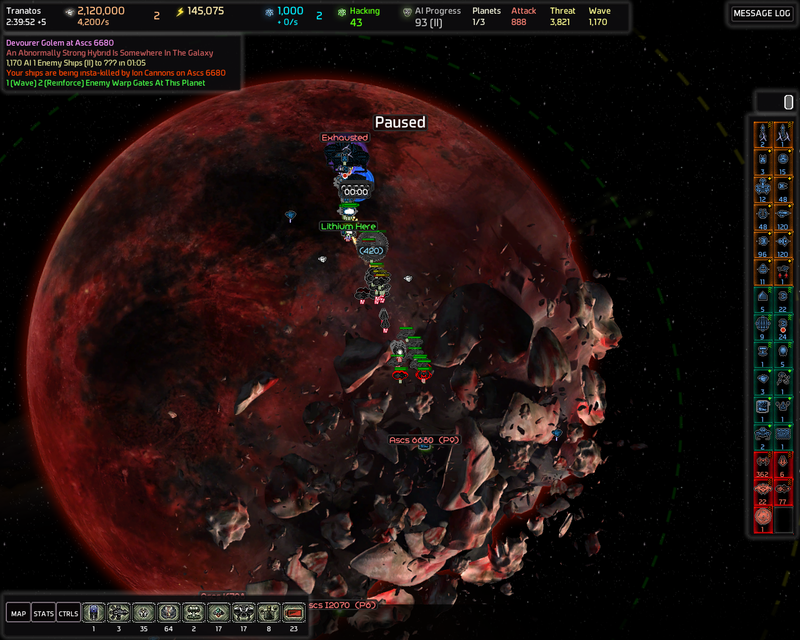 And I did handle it even though I accidentally triggered a Raid Engine and 2 waves spawned and joined the fight. 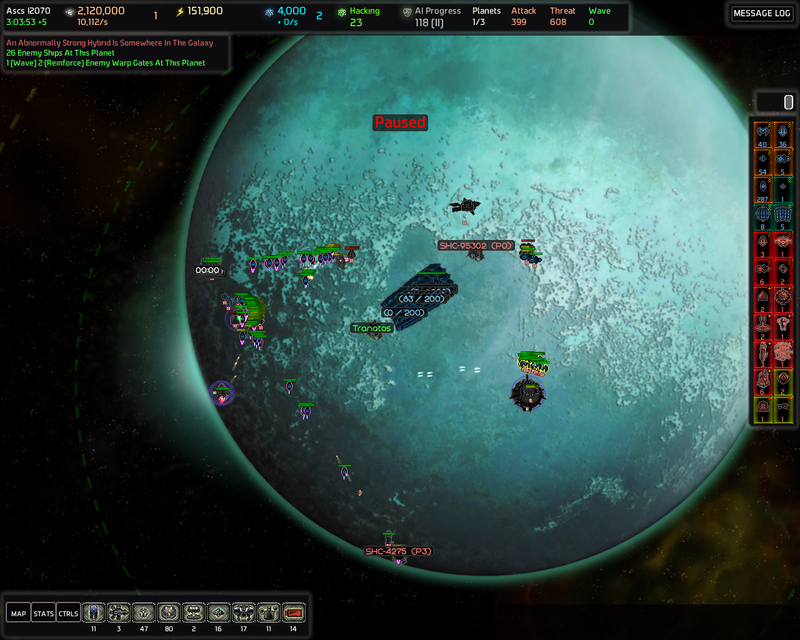 Shield Bearers protected Bombers which allowed them to get in range of my Command Station. 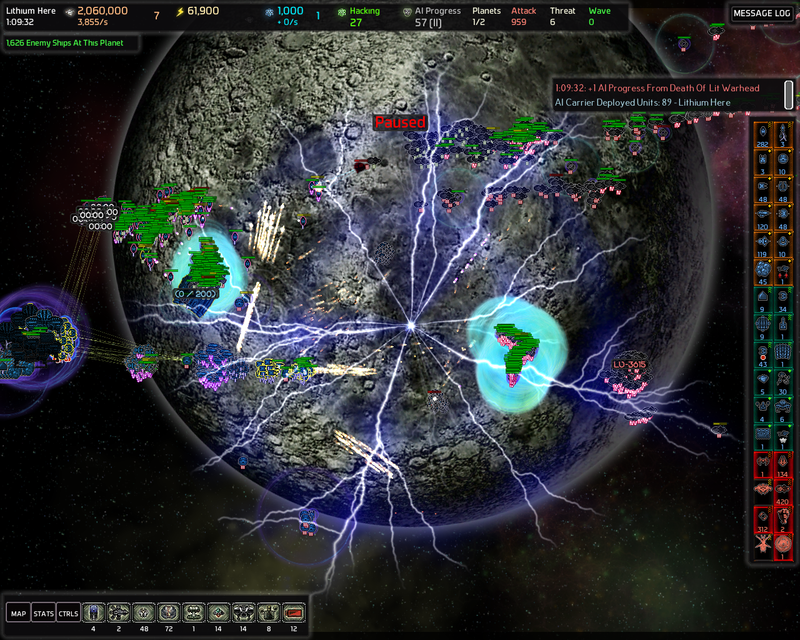 Implosion and Missile Guardians kept pounding on my Force Fields from long range. 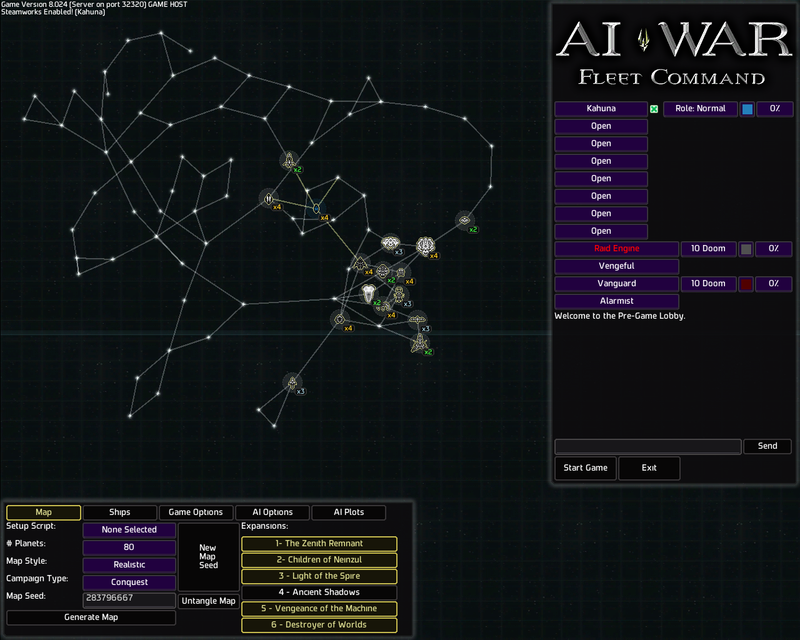 About 159 AI ships disabled by the Mark II Military Command Station again. Argh. Oh well this is still easily cleaned up but late game this will become a problem unless I am able to sabotage that Shield Bearer Database quickly. I literally just alerted all the guards on this planet and it's filled with Guardians again. Well I'm just going to pop the Command Station now. Already destroyed the Command Station Shield Guard Post. I triggered the alarm by doing that but that didn't do much for the AI in this situation. Had the surrounding planets been on alert for a long time it would have been a mini CPA. AIP jumped from 15 to 40. Now it's starting to get fun. Aaand neutered. 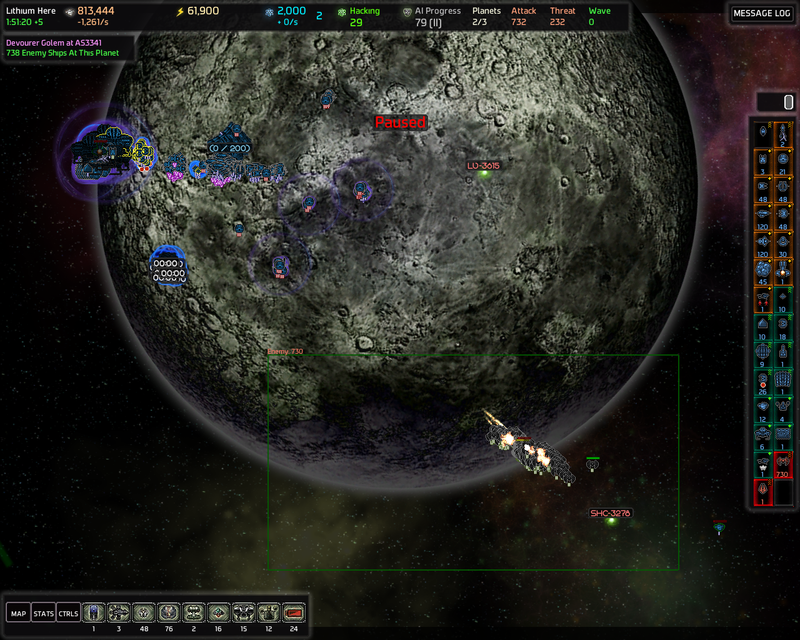 Now I'm just going to capture Hephyrus (and the Fabricators with it mmMMwhaha!) and insta build all the Gravitational Turrets and Force Fields before the threat hanging on LV-3615 come and do their thing. 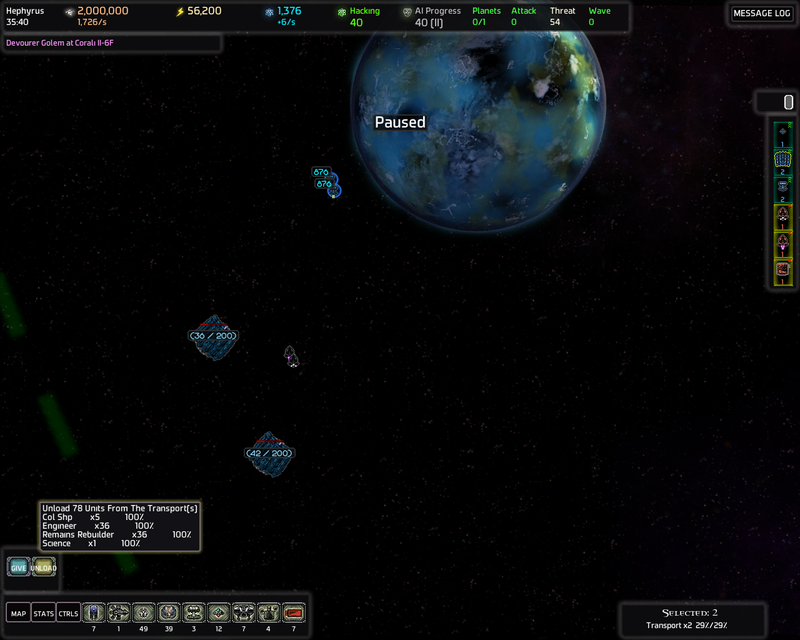 Also the in-game time is at 34m now so the Hybrids are starting to mass up. I set Hybrids to 5/10 for both AIs, which isn't that bad tbh. 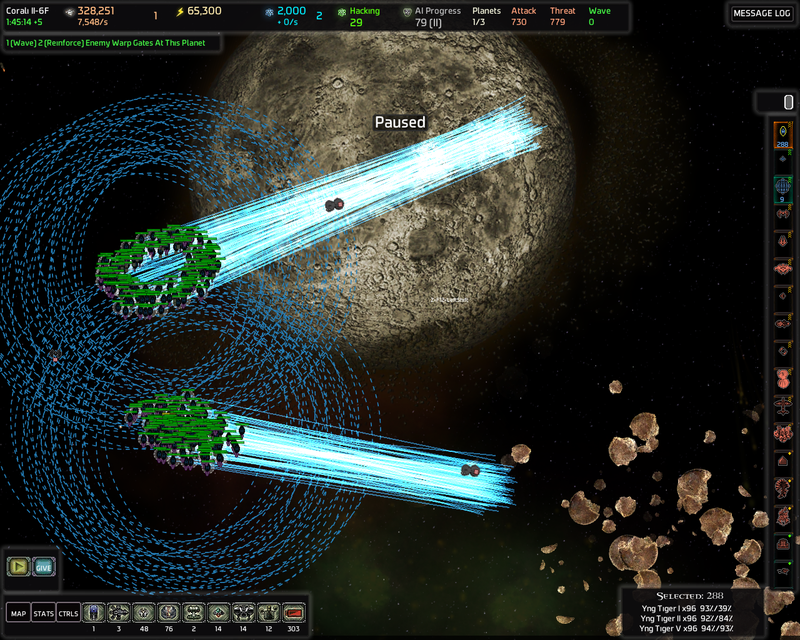 MSDs and NTigers are going to cover the Transports by spamming the Hybrids and threat on SHC-3278. 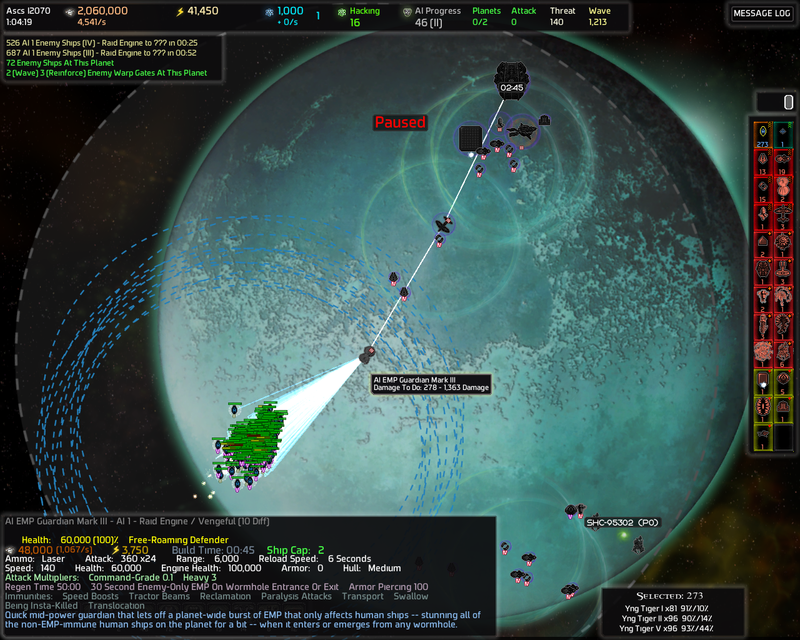 The threat is probably going to come through AS3341 so I'm also going to insta build a lot of Space Docks and rally point NTigers to AS3341 to delay the AI. Need to focus build that Energy Collector so I can finish my setup ASAP. Good thing I have full metal storage from all of that salvage from all of those AI's attacks. And sure enough the threat arrives in no time. Luckily the defense are building very quickly. Need another Matter Converter. Energy and metal is going to become a problem at some point so I'm going to have think about how I'm going to solve that. Focus building those Mark V Sniper Turrets to get rid of these Guardians. 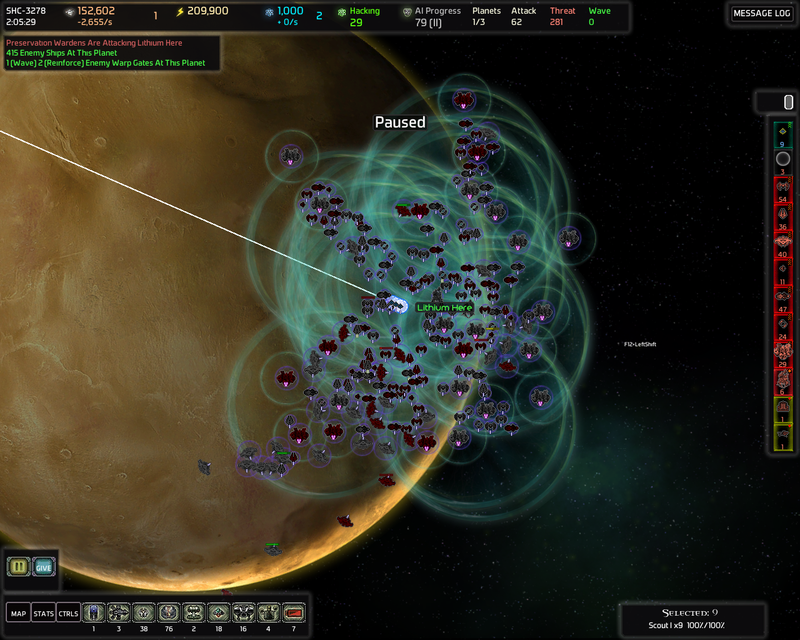 Look how many drones those two Enclave Guardians spawned in a few seconds.. that's insane. Good thing the calavry has arrived. I ordered those MSDs and NTigers to come help immediately and am going to focus fire those Missile Guardians first. 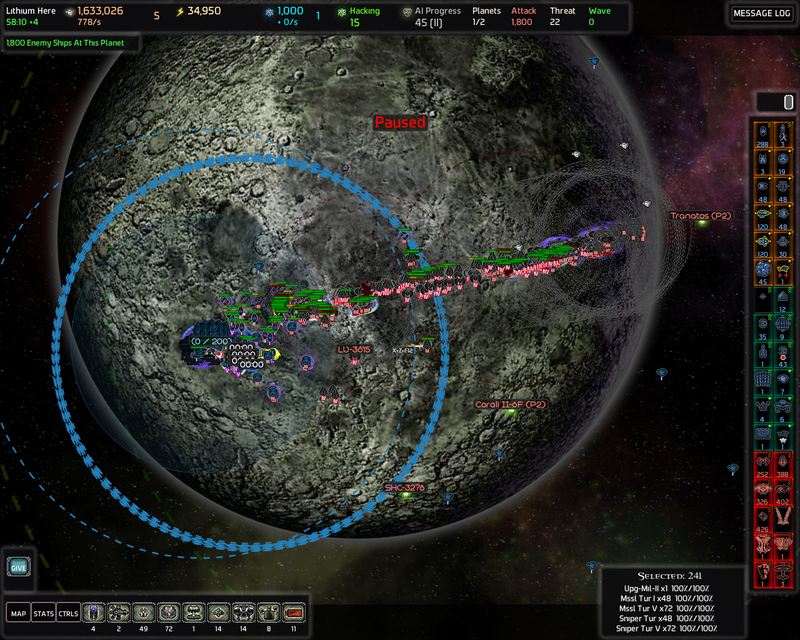 The Space Docks are ready too so time to test Core NTiger spam! ..never mind. All of the AIs died before I had time to spam them. Oh well. I will get to try them out soon. Hephyrus is fully built and secured. And yeah the NTigers are basically walking over the AI on AS3341! And WHAT? I didn't remember Core Turrets have a cap of 72! Wow that's going to make my defenses extremely powerful strong. This seems like a good milestone to post a save file and take a break. 00h38m.sav attached (Yeah only 38 minutes of in-game time with this much of progress). Go play with the tigers and defenses. It's oh so satisfying. One of my favorite playstyles. 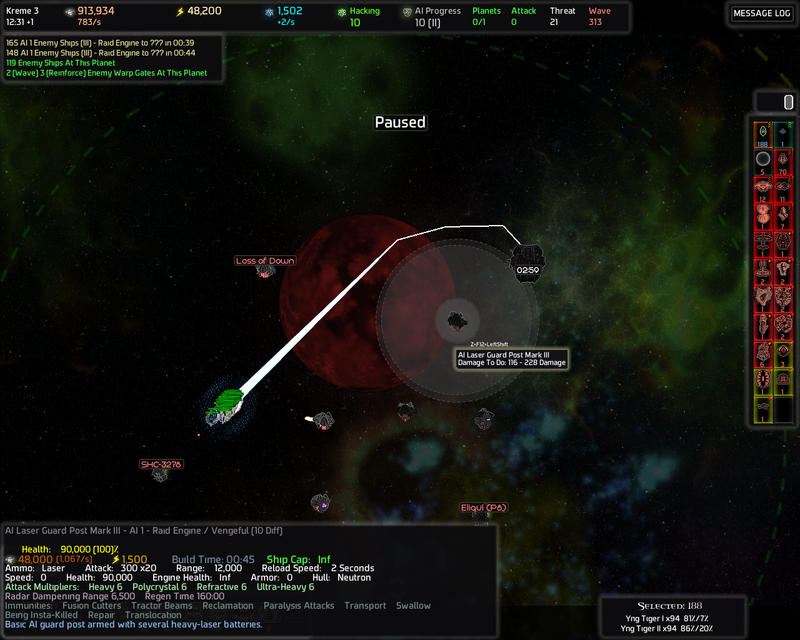 Now off to hack the Core Missile Turrets on Eliqui. I split the Engineers and Mobile Builders between 3 (normal) Transports so I can unload all of them faster and focus build a Counter Sniper Turret to counter the Mark III Sniper Turret. Good thing NTigers are immune to sniper fire. And insta killing too. HoweverEngineers and such are made of paper. I'll also have to be careful because MSDs aren't immune to snipers. They're expensive so don't want to waste metal. The beachhead is going to be expensive. Perhaps even reprisal worthy. It's actually a good thing this planet has a subcommand. 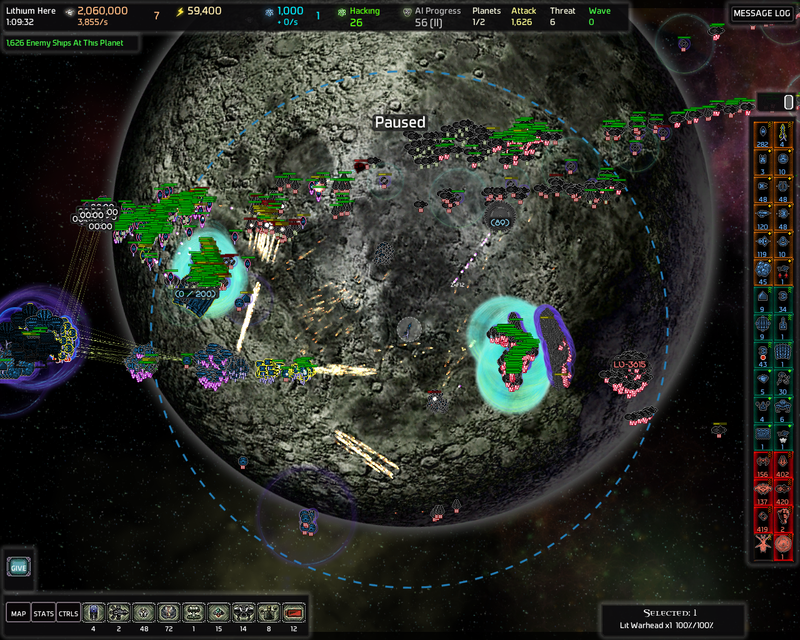 All the things are bunched up near the AI Command Station so there's plenty of distance to my beachhead. Foot has been set on Eliqui. Except what's that.. 5 Ion Cannos. Welp that changes things. I didn't notice them. And what on earth is with the Drones.. that's spam of epic proportions. Dare I say slightly excessive. That's roughly 100 drones from a single Enclave Guardian in an instant. Yeah I'm just gonna leave the hacker to do it's thing and retreat. Will deal with the threat with my defenses. Hopefully. Vanguard's hacking response seems very mild so far. 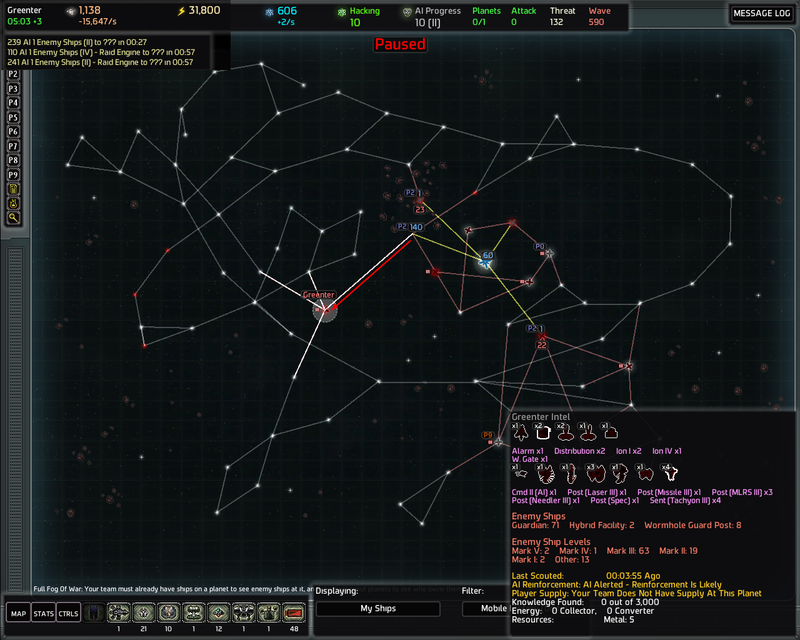 I'm going to deal with the Guardians it spawns by sending NTigers through the wormhole. 2 minutes 50 seconds of hacking left. Also 2 waves were announced. -The wave of 26 ships was 26 Missile Guardians. Am going to meet them with NTigers before they get on my planets. 890 ships will be harder. 1 minute 28 seconds of hacking left. -Ah it was 890 Bombers. My Sniper Turrets will shred them to pieces. Free salvage. 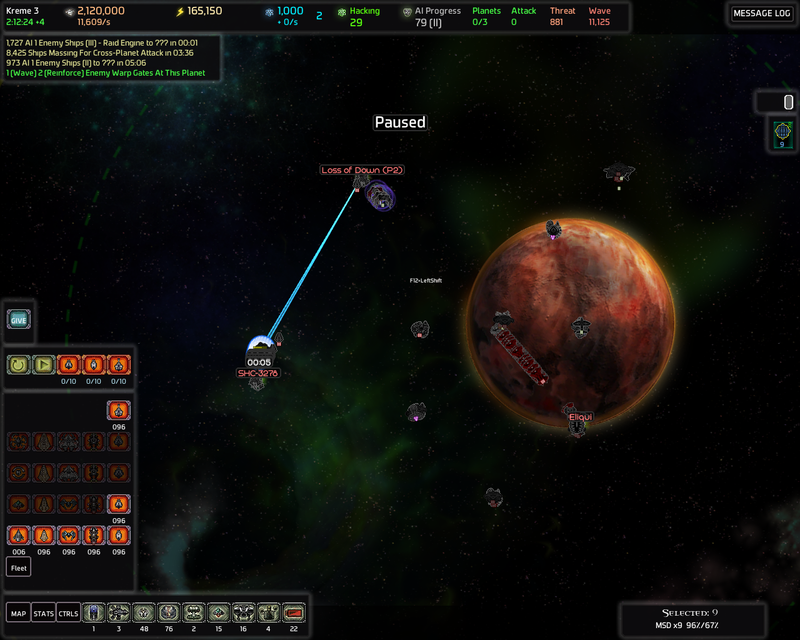 And on my Homeworld too so will get 40% of the salvage. That will probably top off my metal storage. -The hack is successful and threat is at 49, which is probably 49 Guardians but that's no biggie since I got my Core Missile Turrets and there was no EMP Guardians. NTigers did a good job at keeping the accumulating Guardians at bay. 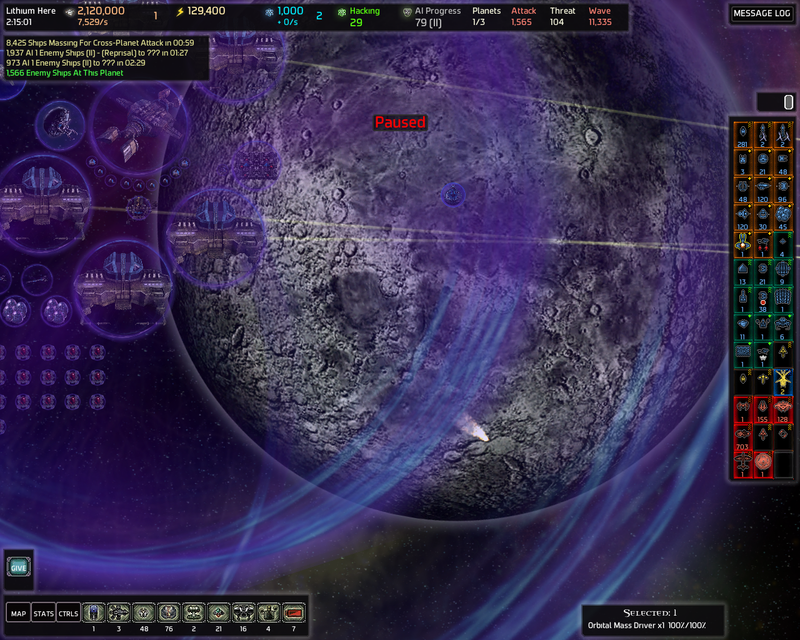 -I also unlocked Mark III Gravitational Turrets to give Mil CSs and long range turrets more time to do their thing. My next step is to capture Tranatos. 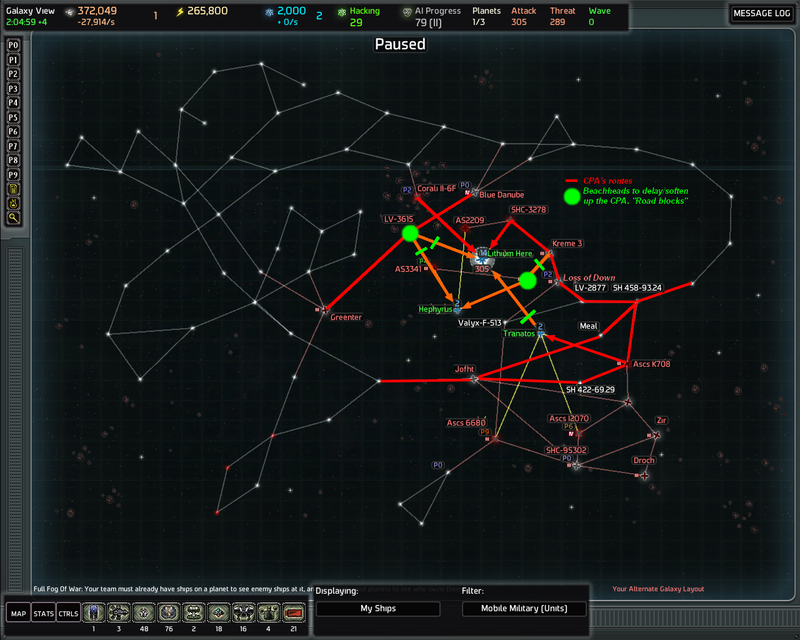 It seems like a likely route for a CPA since it's connects my Homeworld to the rest of the galaxy. 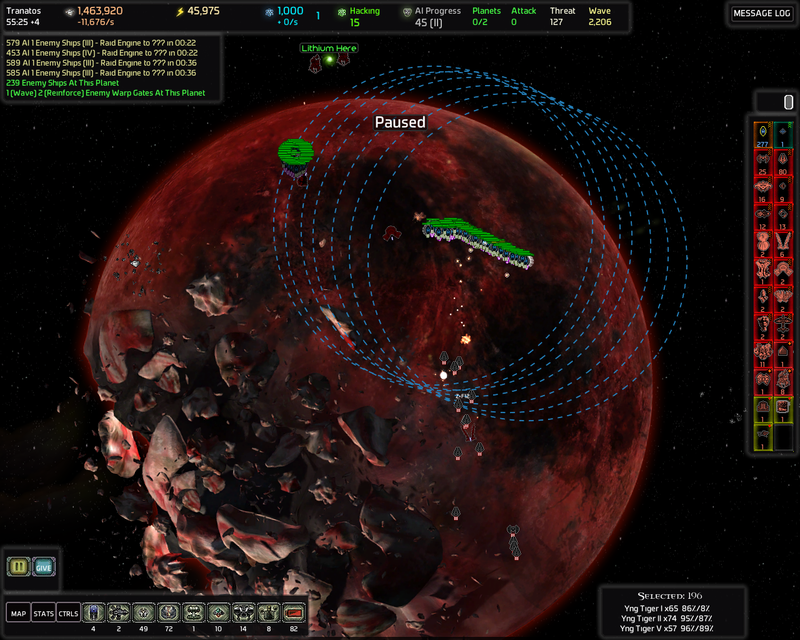 It also has 5 metal asteroids which is ok. I have 1000 knowledge now and after capturing Tranatos I'll have 4000 which is enough to unlock Mark II Metal Harvesters. Ascs 12070 and Ascs 6680 both have a Raid Engine but luckily they're quite close to Tranatos' wormhole so I should be able to get both of them in one go. 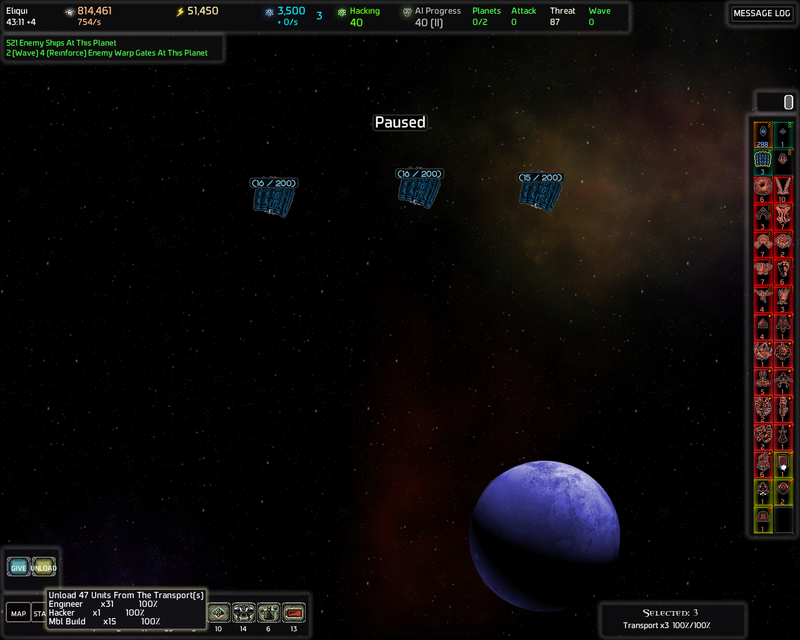 ...and sure enough a few seconds later as I enter Ascs 6680 to destroy the Raid Engine. The worst case scenario just had to happen didn't it. I saw it coming. As you can see I disabled the stand down mode only after all NTigers were in range of the Raid Engine. No waste shots or time to reload. 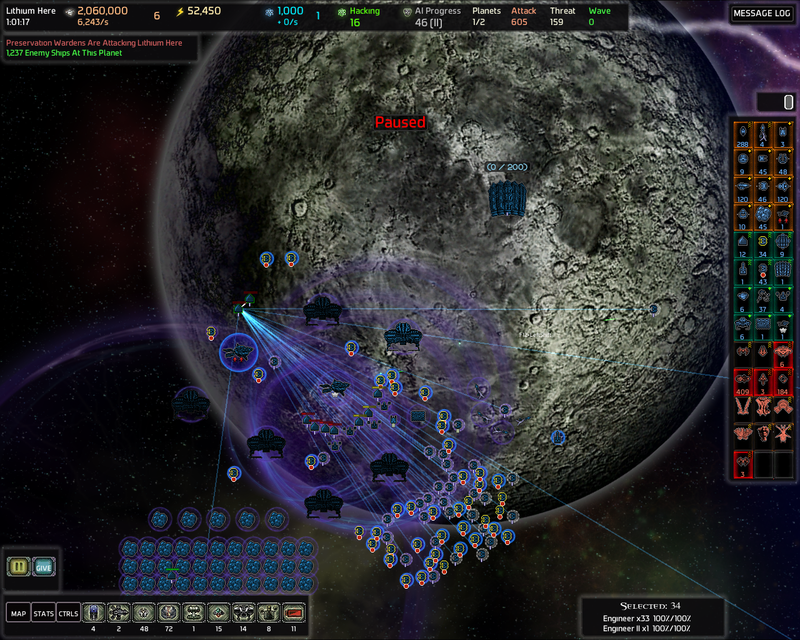 Some of the NTigers got caught by Tractor Beam Guardian on the way. 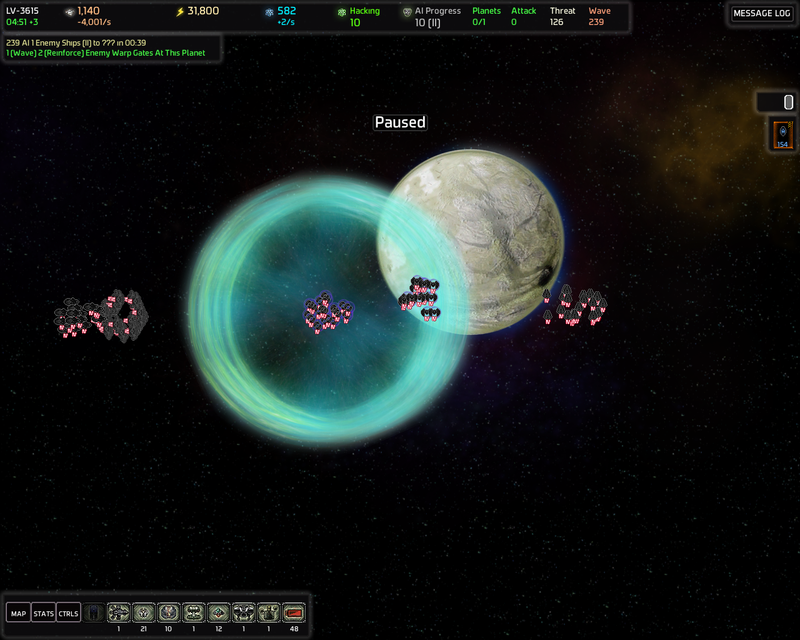 I scrapped them to avoid getting an unnecessary Raid Engine wave since the Tractor Guardians have a bad habit of dragging the ships to AI planets that will alert Raid Engines. Of course.. ..I also alerted 3 EMP Guardians. I'm going to wait until they both have "blown up" Tranatos and then "meet" them half way through with my NTigers. In stand down mode until they get in range to one shot them of course. Assassination. 2 more EMP Guardians left. 70 NTigers got caught by a Tractor Guardian. ...Yeah I'll do another run. Tried to go around them but the Spire Gravity Drains got the NTigers and they all got killed pretty much instantly. And they have arrived. 1800 ships. 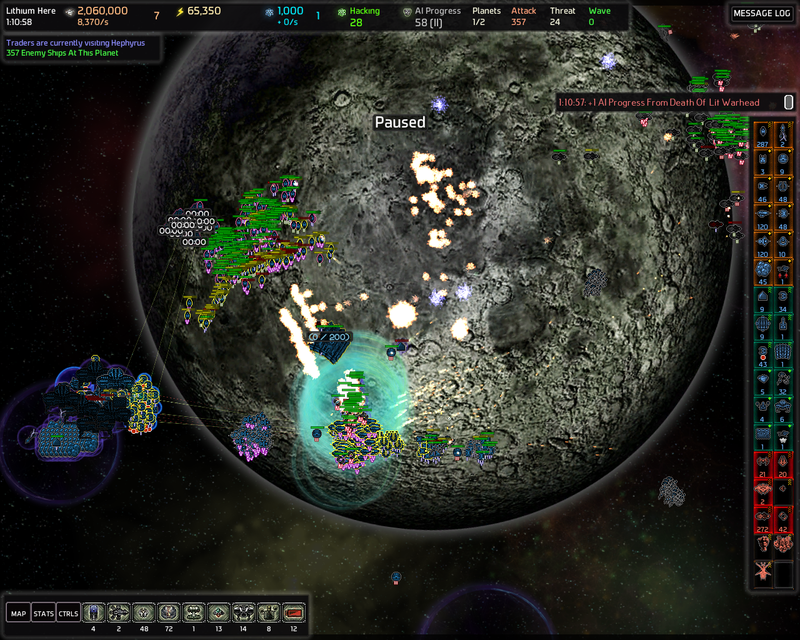 ~600 destroyed already but those Shield Bearers (426 of them) are starting to stack up and cause a problem. Am going to focus fire those Bombers with all the turrets before they get under the shields. I'll use a Warhead only as a last resort solution. Holy cow look at that stack of shields.. *puts finger ready on the red button to launch a Lightning Warhead* I'm focus firing the Shield Bearers with NTigers and Needler Turrets. 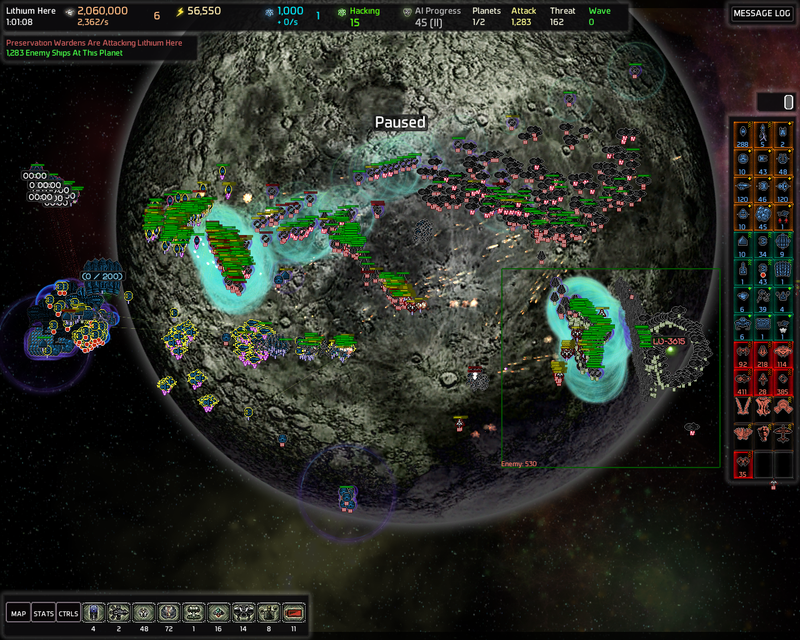 I managed to get rid of the Bombers but oh dear lord.. ~500 more AI ships appeared and probably 100 more Shield Bearers. Yeah, now I got my dose of cryptonite. Ok now Imma press the red button. Right. That didn't do as much as I'd have liked. Of course the Shield Bearers closest to my Command Station survived. Going to do this trick again. Focus building Force Field next to everything else. 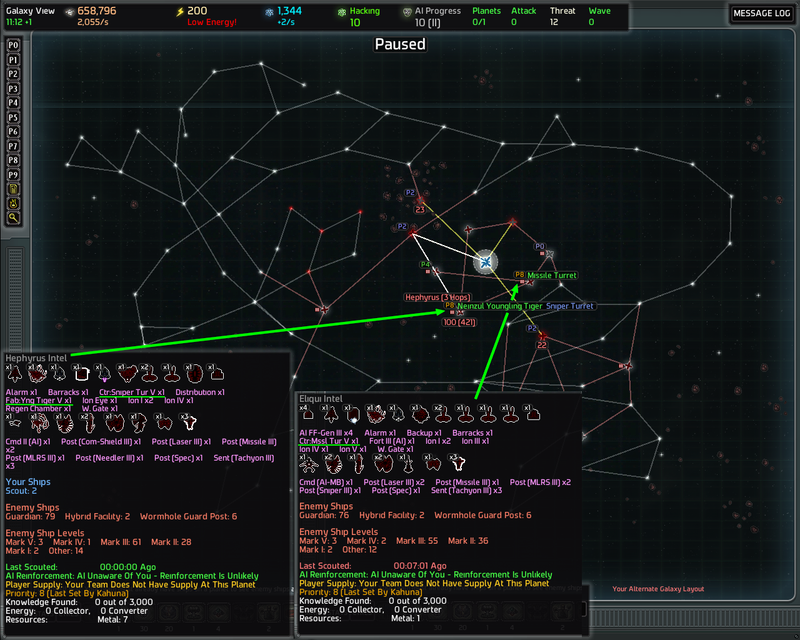 I barely made it without having to use another Warhead.. My Home CS got down to ~50%. Luckily Shield Bearers don't do that much damage. However they do do a lot of damage over time since it takes forever to kill them. And they all cover each other when they stack up so it's not like you can kill them one by one. 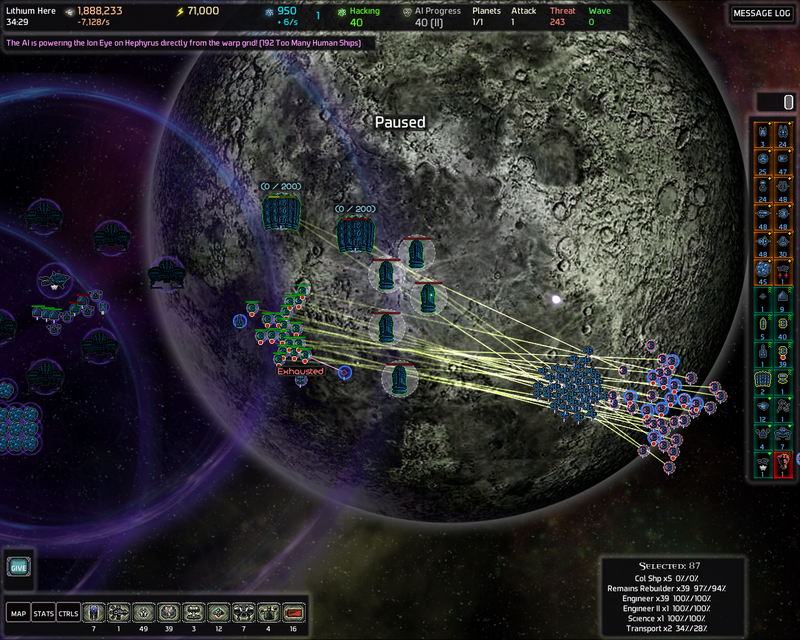 They all get to like 3% health and when ALL of the shields are small enough they can no longer cover each other. Only then they start dying. So they maintain their full dps extremely long..
..That was annoying in a good way. Unlike those ZSEs. 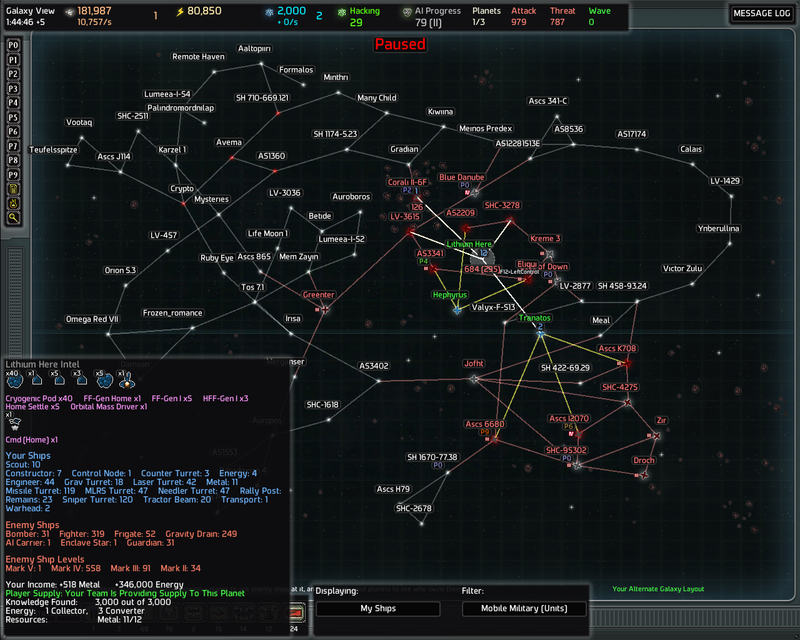 Now off to destroy the Raid Engine in Ascs 12070 and then capture Tranatos. But before that I'm going to take a break and hit the gym for the first time after the flu in a bit over 2 weeks. I'll be back. Feeling quite good about this game. That is an awesome set of fabricators. Someone's going to regret leaving those toys laying around. I forsee the shield bearer design backup getting the hacking of a lifetime. The most awesome thing is the fact that the Fabricators are so close to each other and most importantly close to my homeworld. Edit: And the fact that I was able to capture/hack them in under 50 minutes. In most maps Fabricators, Advanced Factories and such are at least 5 or more hops away. 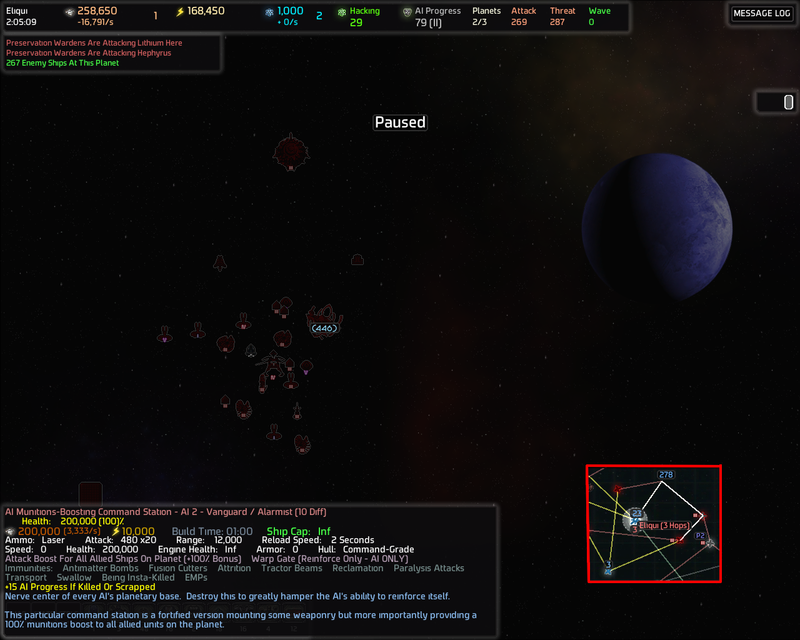 In this map the max distance from my homeworld is 10 hops and that's only to one planet. 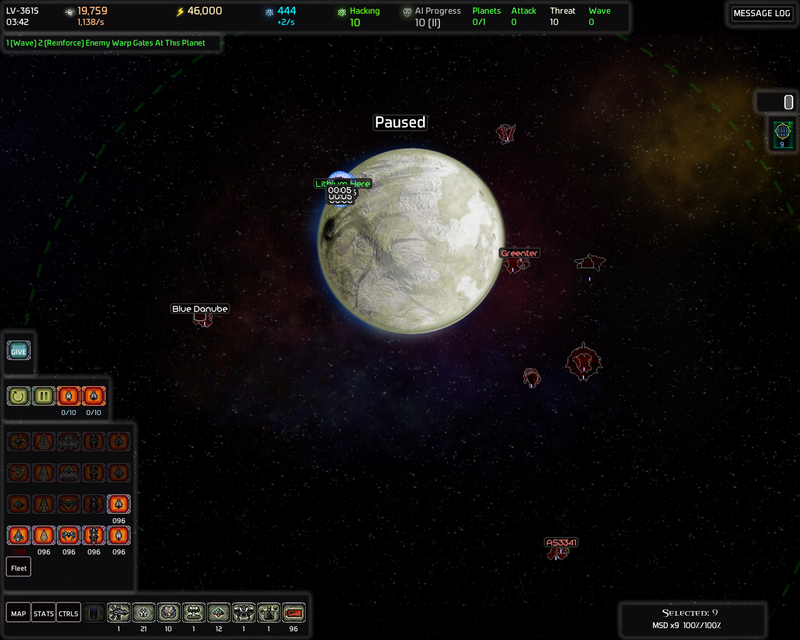 Edit: Actually I had ticked the "Avoid planet during auto pathing" on LV-3615 so those distances are incorrect. 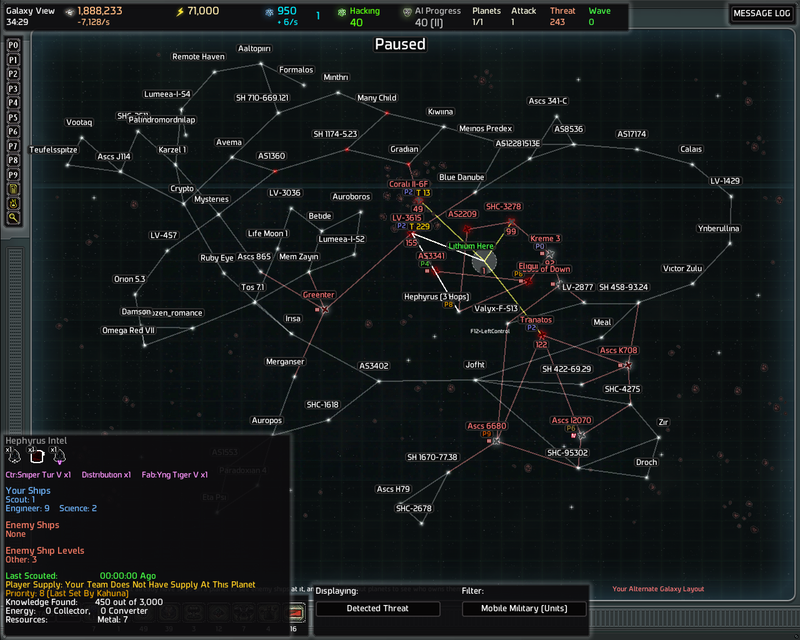 Based on the number of hops to various places my guess is that the AIs' homeworlds are Formalos and Eta Psi. But they could as well be LV-1429 and either Palindromordnilap or any of the yellow planets. We'll see if I'm correct. 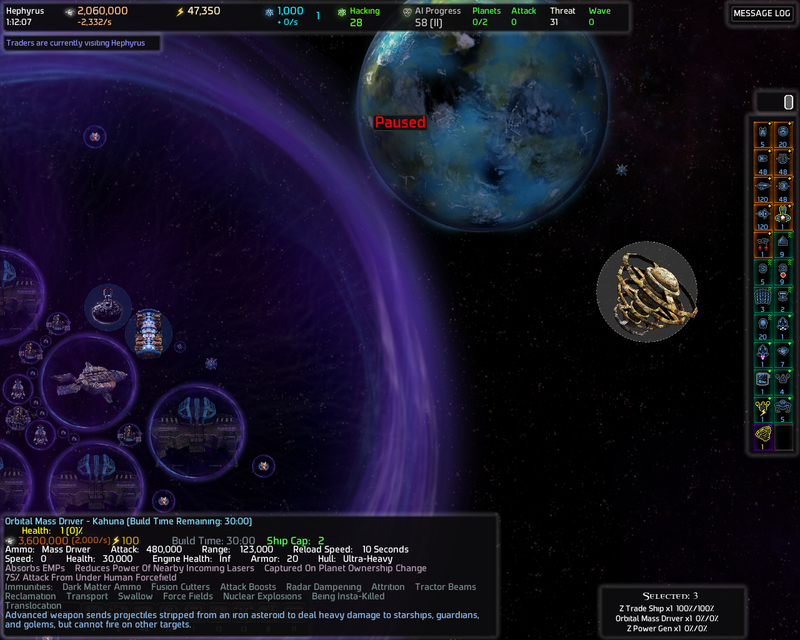 Based on the number of hops to various places my guess is that the AIs' homeworlds are Auroboros which 10 hops away from my homeworld (the yellow one) and Formalos which is 8 hops away from my homeworld (the rightmost orange planet). 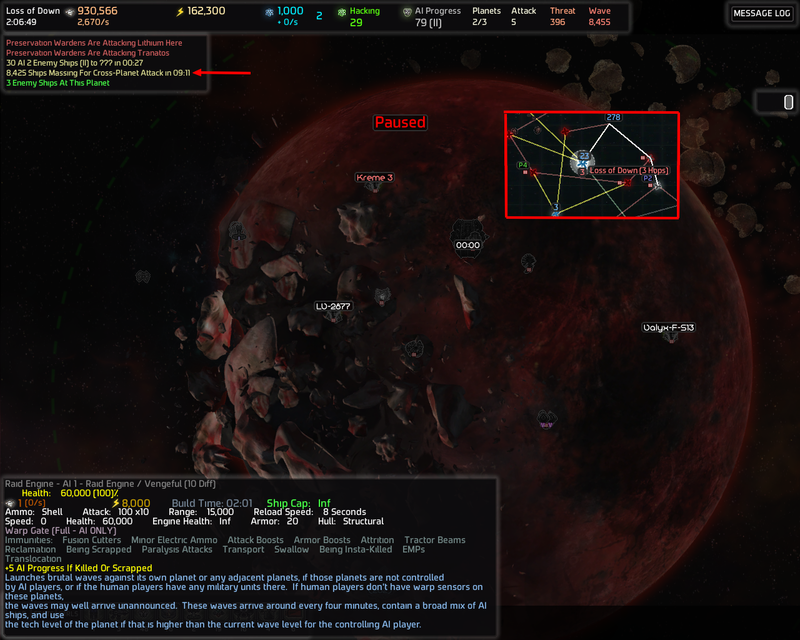 The distance between Auroboros and Formalos is 12 hops so I think it's very possible for the AI homeworlds to be in those positions. We'll see if I'm correct. 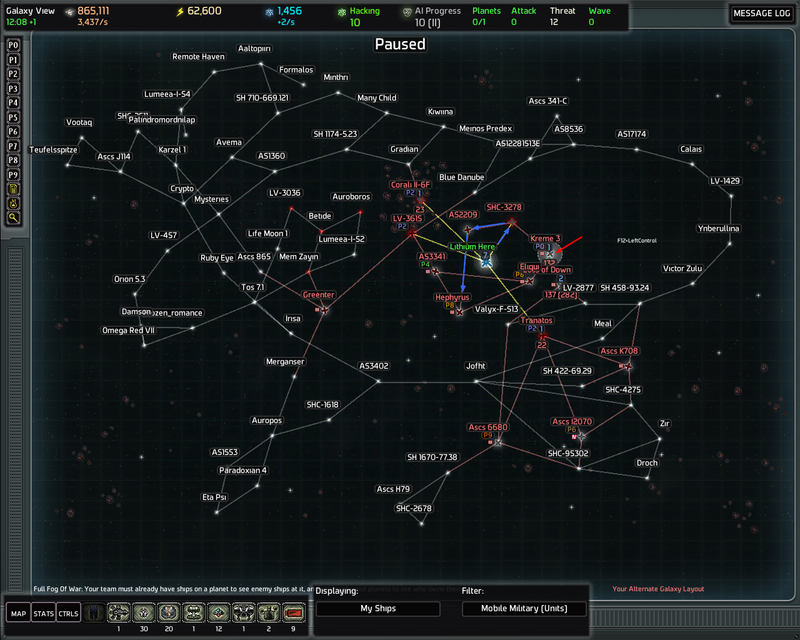 If I'm not my second guess is that the homeworlds are some other planets I've marked on this map. 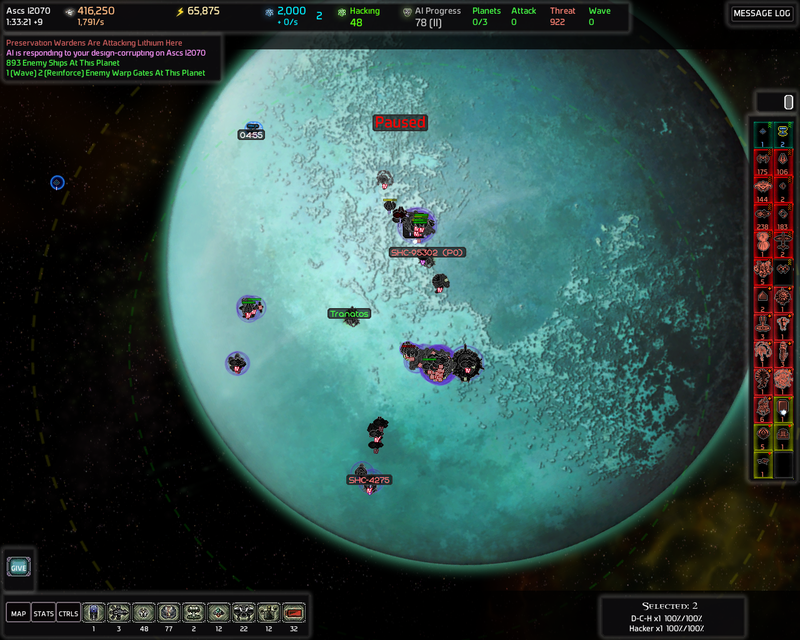 Speaking of AI homeworlds I realized I'm not going to have Cloaker Starships to cloak Warheads. Arf. Yes the Shield Bearers are going to get the ban hammer. Now lets get rid of the rest of the Raid Engines and capture Tranatos. So there's a Raid Engine on Ascs 12070 which is adjacent to SHC-4275 which could also have a Raid Engine. And based on the last attack I did there's also a Raid Engine on SHC-95302. SHC-95302 is adjacent to Zir and Droch which could both have Raid Engines of their own. So in the worst case I'm going to trigger 5 Raid Engines! Luckily SHC-4275 didn't have a Raid Engine. Can still get 4 RE waves. Am going to first focus down the EMP Guardian, then the Widow Guardian and then the RE. Then back to stand down mode and to SHC-95302. And as I enter SHC-95302 a third RE is triggered. 2302 ships incoming of which probably like 400-500 are going to be Shield Bearers. 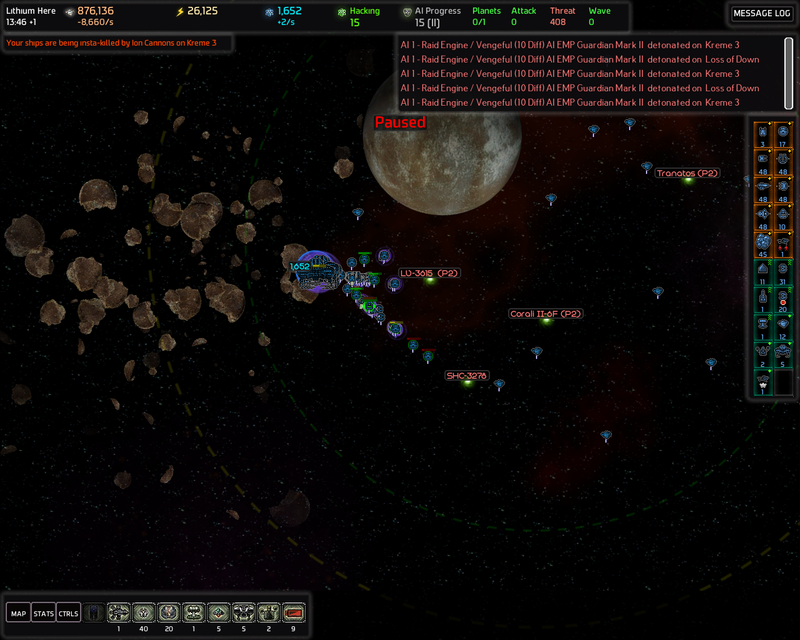 At least I have 4 Mark I Lightning Warheads ready on my homeworld. SHC-95302 has 3 EMP Guardian of which 2 are between my NTigers and the RE. Going prioritize them again and hunt down the third one after destroying the RE..
..Actually no I'm not going to hunt down the third one since it flied away as threat, great. All REs destroyed and the AIP is now at 56. I think this is a pretty good representation of what's coming. There's 102 Mark IV Shield Bearers and 122 Mark IV Bombers. Good thing Bombers are faster than Shield Bearers. 120 Mark IV Bombers destroyed in 15 seconds. That's some good dps. Sending all the NTigers to soften up those Shield Bearers. All of these NTigers unloaded their shots to those Shield Bearers and each Shield Bearer took only 153 damage.. There's 99 Shield Bearers on that stack so all the damage was split evenly between them. And now the third EMP Guardian I was going to hunt down is coming for my head. Going to try to meet it with NTigers but I don't think I'm going to make it because of the Spire Gravity Drain, am probably going to get EMPd. Aaand I get EMPd. At least it's only Mark II EMP Guardian so the EMP lasts "only" 20 seconds. It's going to be long 20 seconds though. Luckily Gravitational Turrets don't get disabled by EMP and there are no long range Guardians or I'd get toasted (Yes I said would before waiting the full 20 seconds. I'm confident I can make it).. 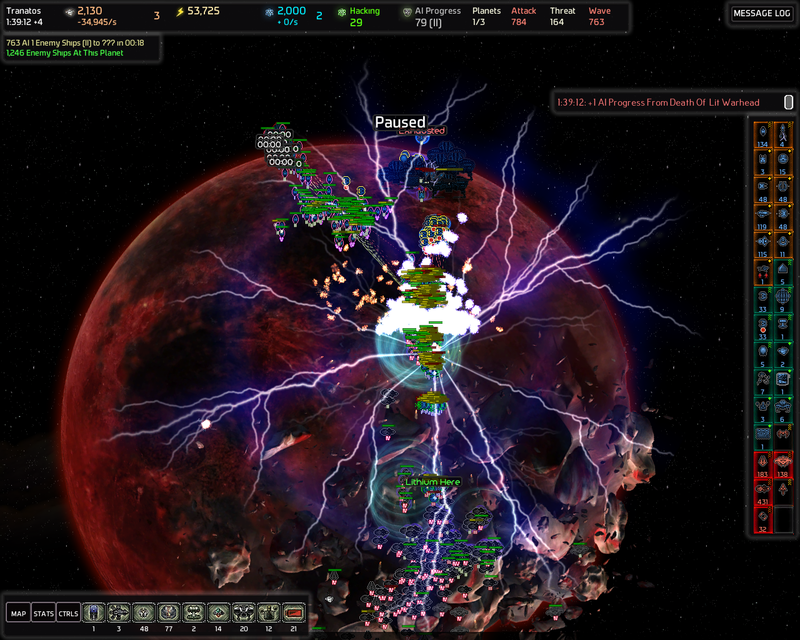 ..Except that now I accidentally entered LV-3615 (The planet where the EMP Guardian came from) which triggered another RE.. +640 AI ships (Shield Bearers) in 57 seconds. Anyway the 20 seconds is over and all is good. Thank you Mark III Gravitational Turrets. 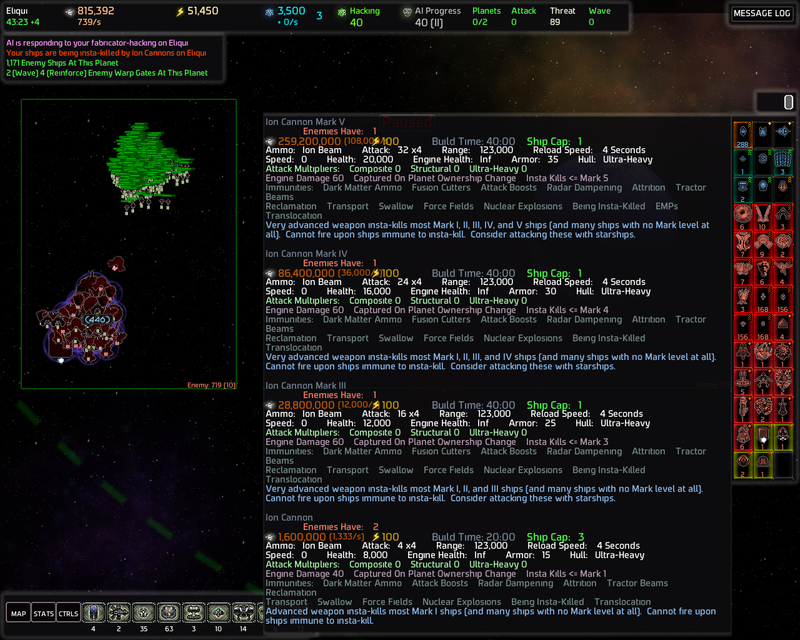 Yeah I totally needed those additional completely unnecessary well over 600 Mark IV AI ships. Don't know what I'd have done without them. Yeah I'm just going to pop a Warhead. Destroying all of those Shield Bearers is going to take so long I'd have to do it anyway. You've got to be kidding me.. Need another one. I'm so going to hack that Shield Bearer Design Backup. 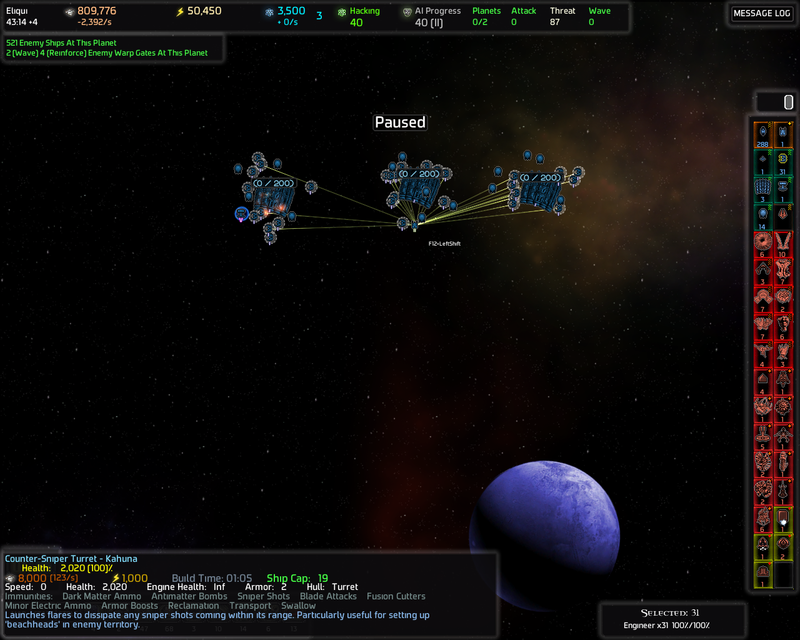 The Traders have come to visit Hephyrus (The planet with the 2 Fabricators I captured). Going to build an Orbital Mass Driver to counter AI Carriers and a Zenith Power Generator with the crazy amount of metal I get from the salvage from the RE waves. And a wave of 27 Guardians was announced. The Vanguard AI seems to be quite pitiful, how disappointing. The OMD is now 9% built and ZPG is already at 28% and Tranatos is captured. I decided to unlock Mark II Force Fields instead of the Mark II Metal Harvesters since I'm getting a lot of salvage from the RE waves and the Shield Bearers have been causing problems. I also found yet another Fabricator nearby. Core Doom Shrooms (Neinzul Youngling Nanoswarms)! Even more Neinzul ships to spam. The RNGeezus was definitely with me when I clicked the "New Map Seed" button and this map was generated. Next I'll corrupt the Shield Bearers on Ascs 12070 and then I'll hack that Doom Shroom Fab on SHC-95302. After that the game might get even a bit too easy. Especially I finish constructing the ZPG and the OMDs. Yes I'm going to build another OMD, probably on my homeworld. Or one of the whipping boys. Aaand now I found a ZPG. And it's conveniently in a corner too. ZPGs have a cap of 1 but additional ZPGs can still be captured even if you have a full cap. You just can't buy any more of them from the Traders. What I could do is first gate raid Droch (the planet with the ZPG) and then capture the 2 adjacent planets SHC-95302 and Zir. 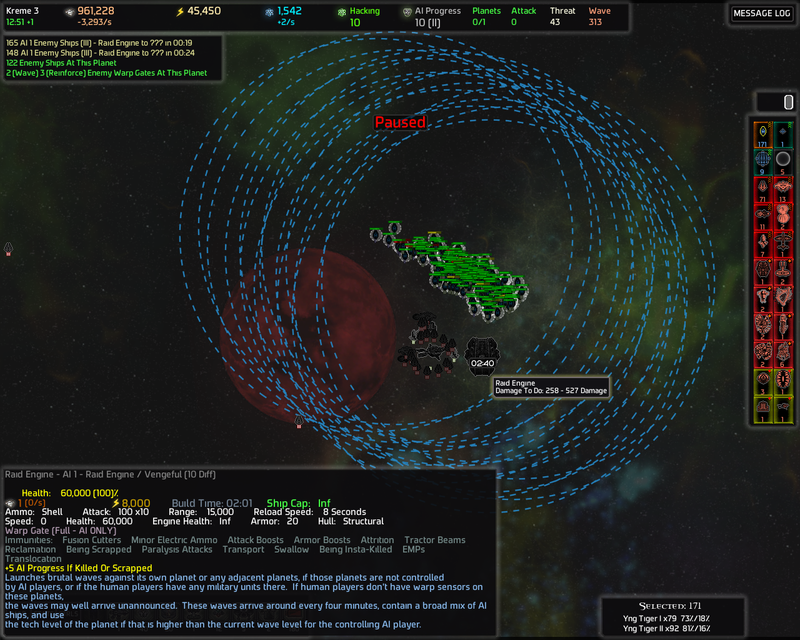 On those 2 planets I'd build the Command Station and defenses on top of Droch's wormhole to defend the ZPG and have depth in my defenses. In addition to that I'd probably have enough energy the beachhead the planets around SHC-95302 and Zir so I'd have 3 hops of depth in my defenses. I'd still hack the Core Doom Shroom Fab on SHC-35302 so I'd not have to worry about losing it. Topped off my metal storage by intentionally triggering a Raid Engine and am continuing the construction of the ZPG on Hephyrus. 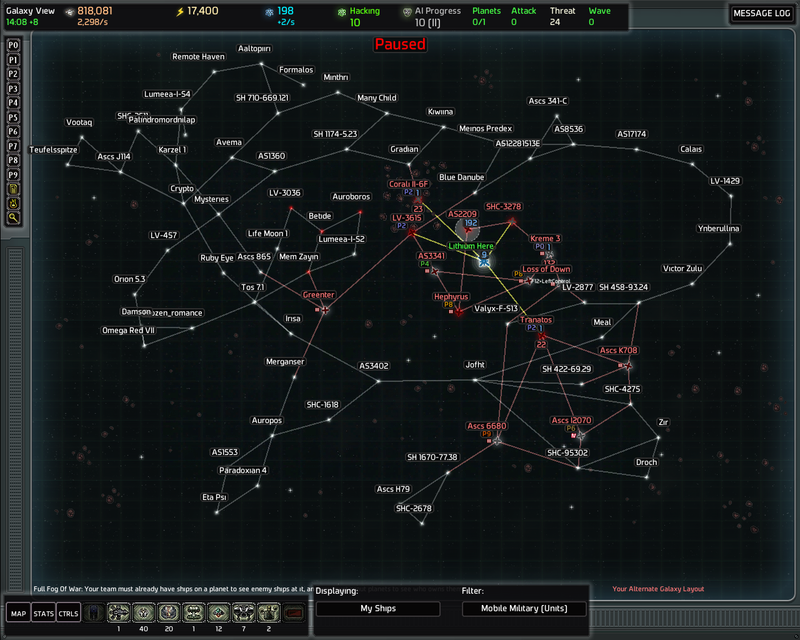 The last wave of ~950 ships is now just hanging on Ascs 12070 so I need to destroy them. 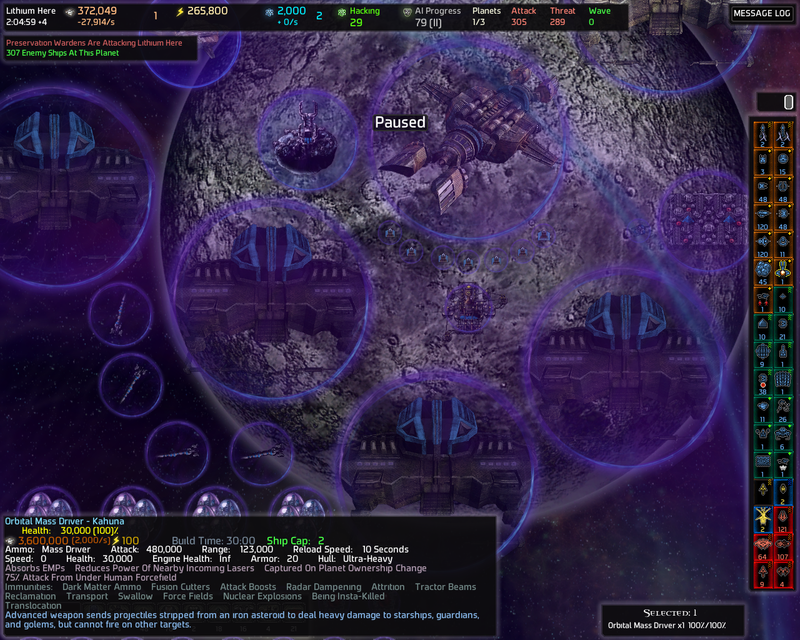 I've already managed to destroy about 100 of them and soften up the Shield Bearers by bombarding the planet with NTigers with the power of 9 Space Docks supported by 35 Mark I Engineers and 9 Mobile Space Docks. 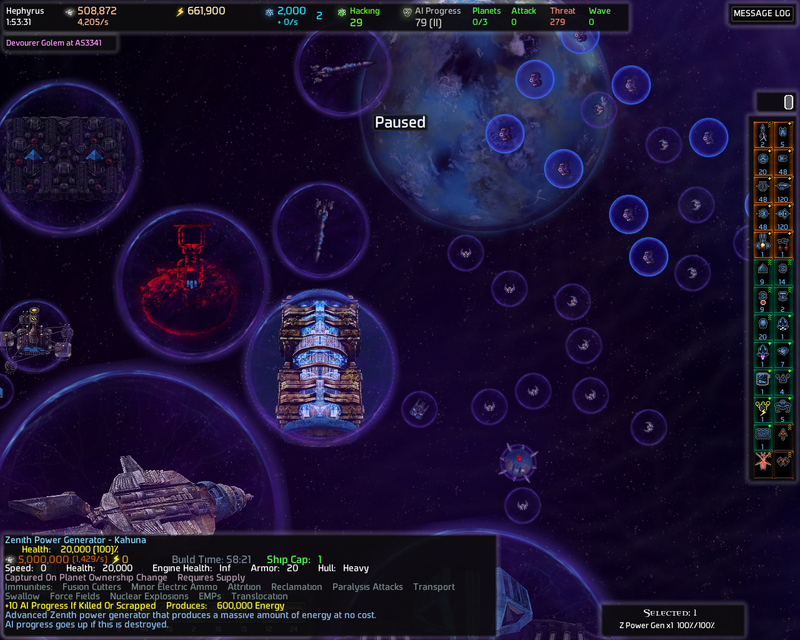 I moved the wormhole on screen close to the side panel so I can click the NTigers and then Ctrl+click the wormhole really fast to keep sending them trough the wormhole. I was so focused on doing this I forgot to pay attention to other things..
..so in the mean time there's 38 Missile Guardian (!) 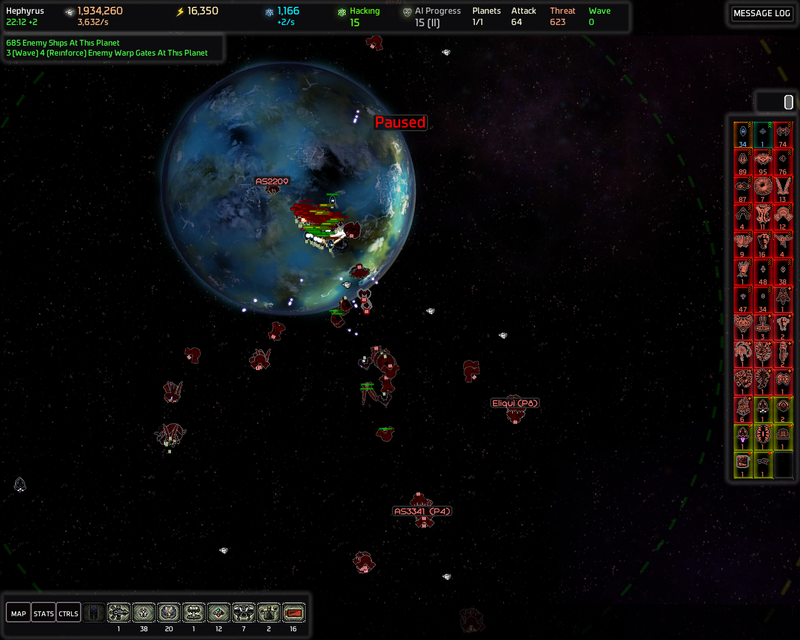 and almost 500 threat on my homeworld. 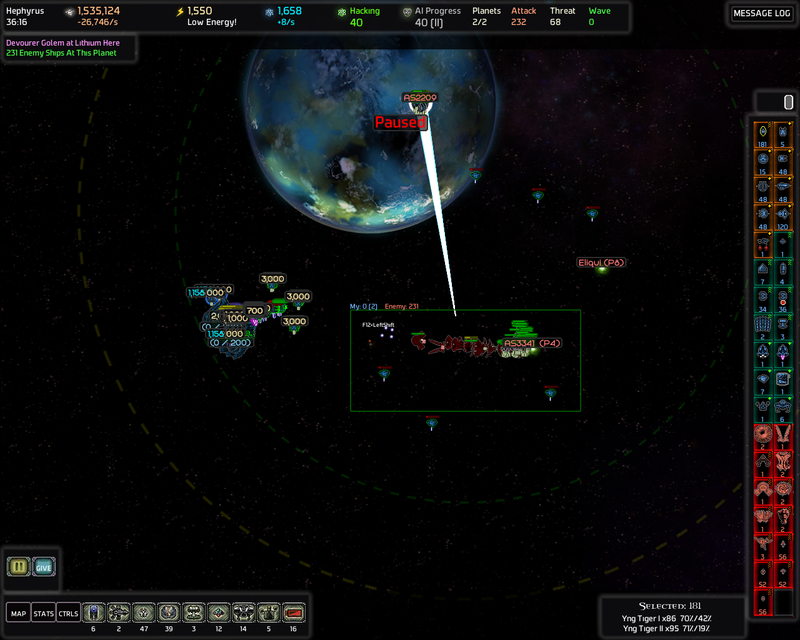 The Missile Guardians are almost in range of my Home Command Station. 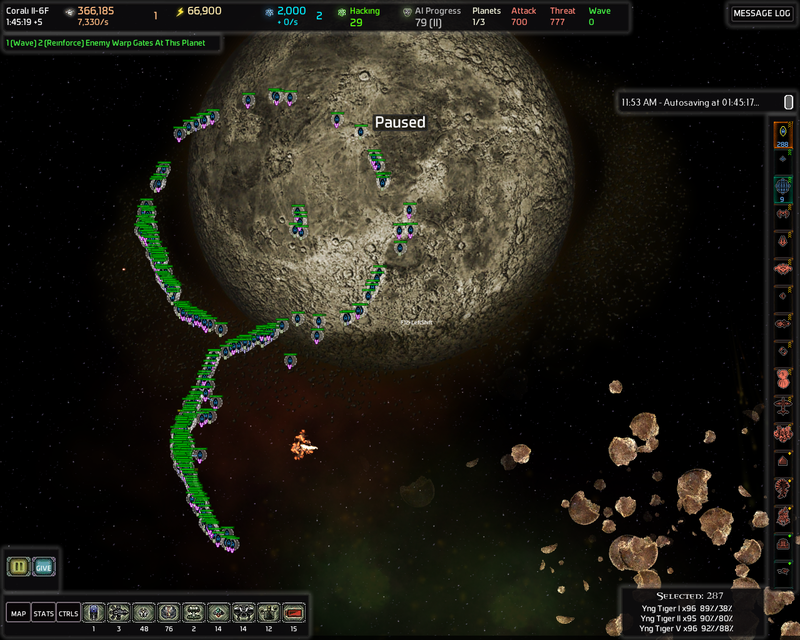 I immediately scrapped all NTigers and directed all NTiger production to my homeworld. Ok Vanguard, I apologize for calling you pitiful. I manually ordered all turrets to focus fire on those Missile Guardians and they started dropping pretty quickly since they're quite fragile. Good thing they also have 12 second reload time so my cavalry (NTigers) arrived in time to help clean them up. 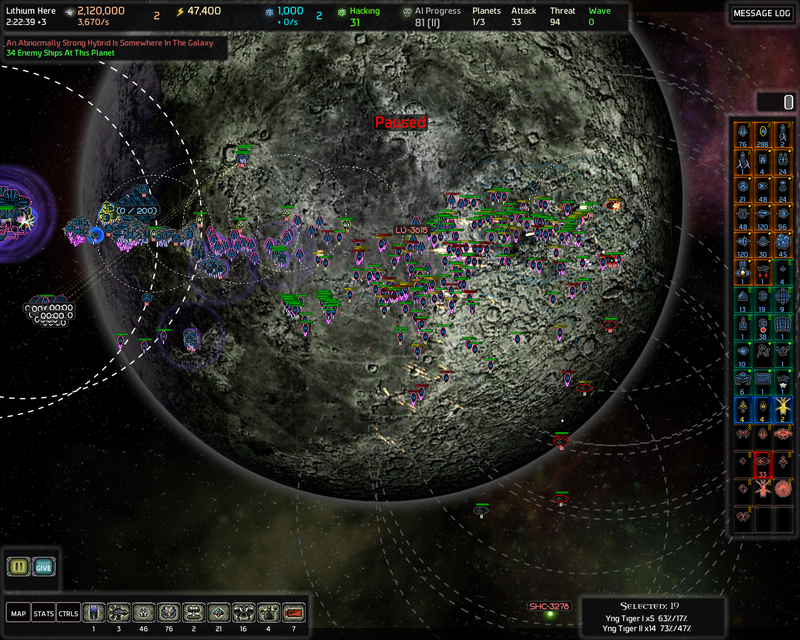 Soon after most of the AI started retreating.. except the Shield Bearers. 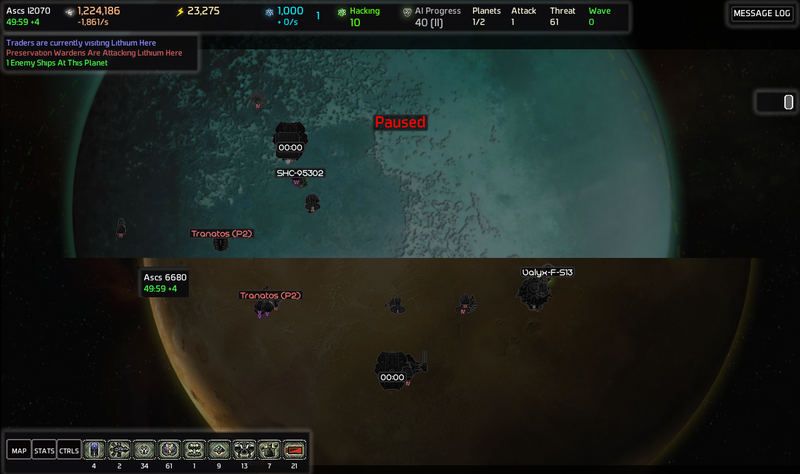 Fighters and Missile Frigates started retreating but Shield Bearers just push on.. Why are they so stubborn.. Also the Traders just arrived on my homeworld so imma get me one more OMD. ..Um yeah, imma start the Lightning Warhead production again and move the 2 remaining Lightning Warheads to Tranatos. Aaand now they're heading for my head. Ugh, they just had to be Mark IV too. The clash of blobs. 2 minutes 24 seconds of hacking left. And then it worked as a very nice funnel to reeaallly clump up those Shield Bearers. Great. My finger is ready on the red button. 22 seconds of hacking left. Yeah time to pop a Warhead. The Warhead cleaned things up quite nicely but those Missile Frigates and Spire Gravity Drains aimed to cause a problem. The Mil CS got down to 50% health so any other CS would have been easily destroyed. I was running out of metal too so I barely made it. 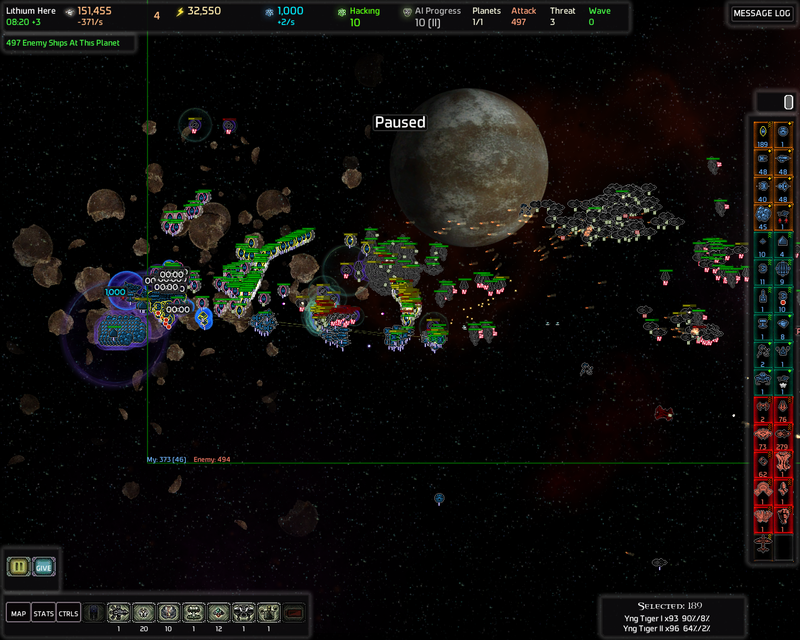 The defenses on my homeworld would have easily stopped the rest of them though. So the defense was successful, and so was the hack. No more Shield Bearers! It was easily worth the +1 AIP from the Lightning Warhead. There's still over 900 threat hanging around somewhere. 2 hours is almost up so the first CPA will be very soon so I need to get ready for it. So now I'm going to top off my metal storages with the help of the Salvage En.. I mean Raid Engines and build some Warhead as a life insurance. Am also going to try to focus build those ZPG and OMDs. 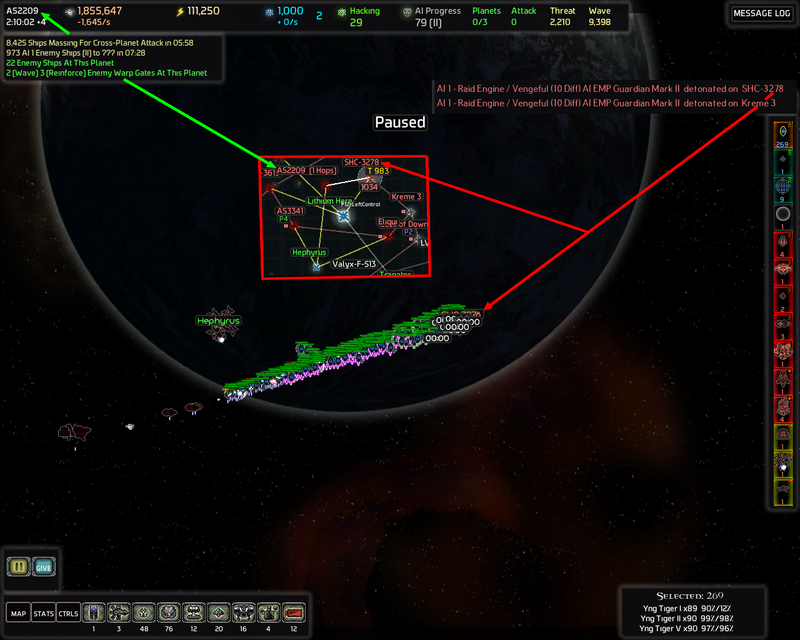 The first Raid (Salvage) Engine I triggered is going to send 1295 ships so the waves are starting to get pretty decent. 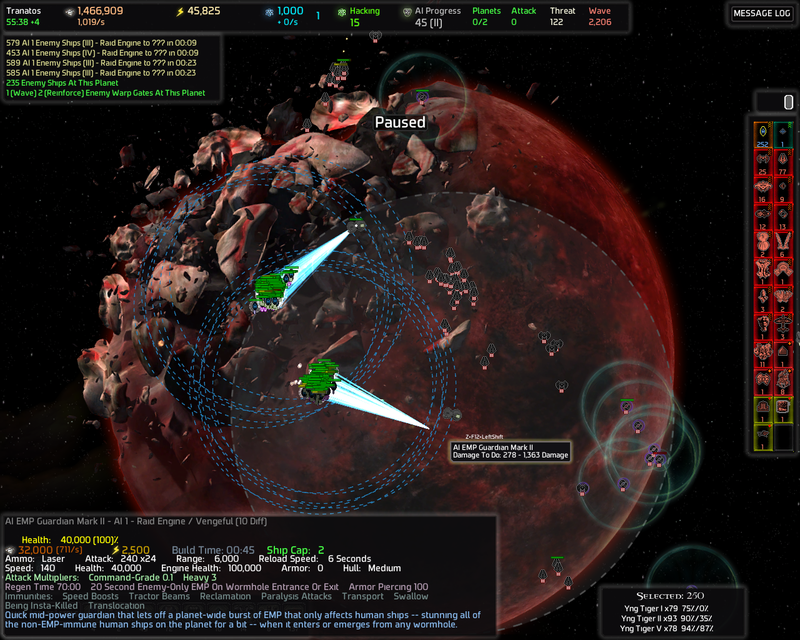 Some of the threat joined the Raid Engine wave. 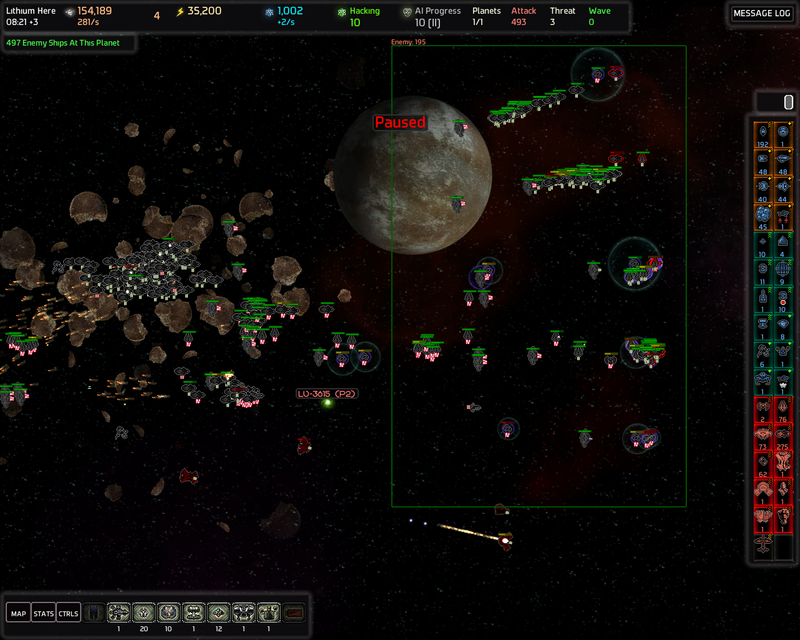 Already destroyed like 200 Mark IV Bombers in this screenshot. 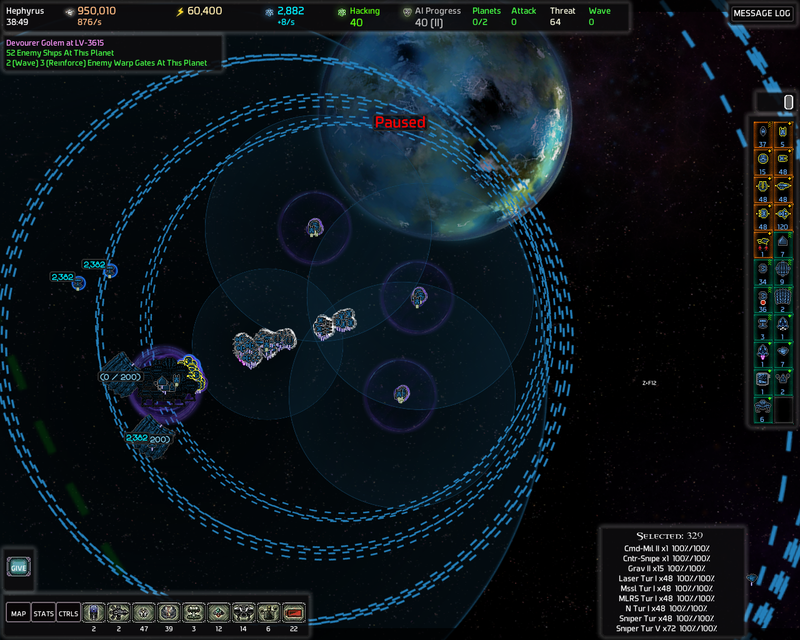 ..And now there's 2 Mark III EMP Guardians heading towards this planet. I immediately disabled MSDs' stand down mode and ordered them to move to Corali II-6F where the EMP Guardians are coming from..
..Phew! 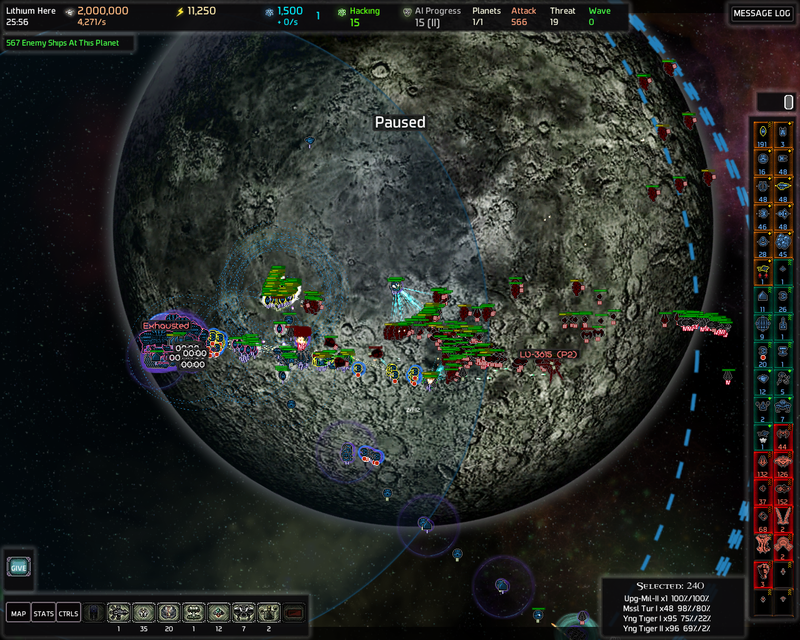 Thankfully the additional strength from all the NTigers made the EMP Guardians to change their course and go camp near the wormhole instead. 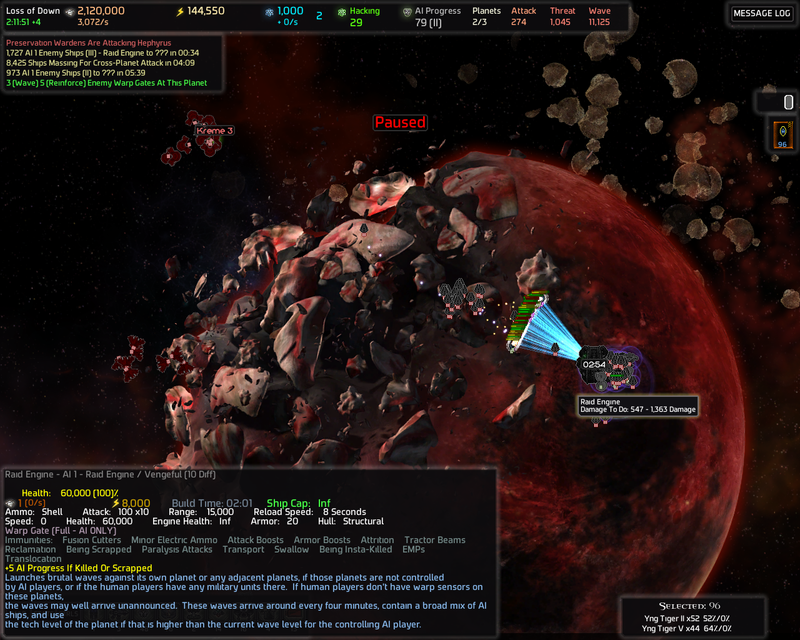 The first EMP Guardian (the lower one) would have made it to my homeworld before the NTigers had it not changed it's course. I'm still going to go in there and assassinate the EMP Guardians. 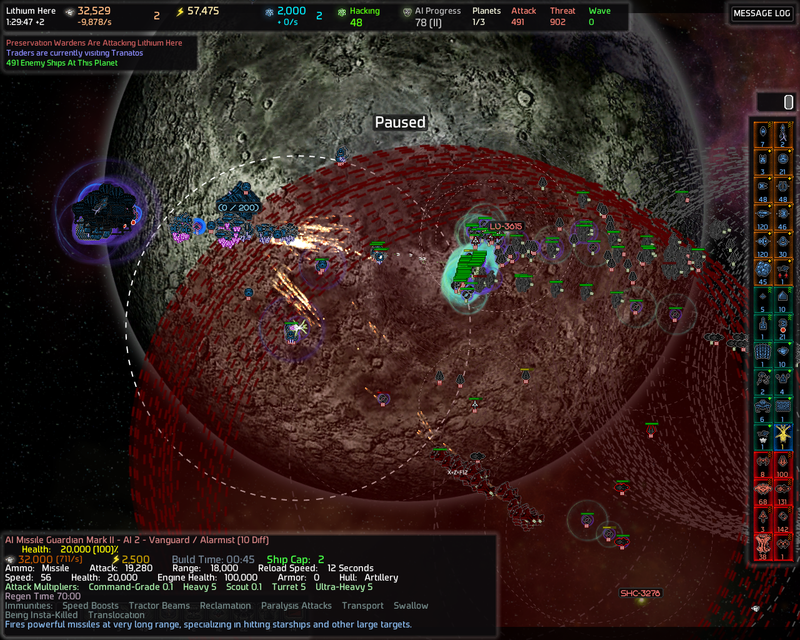 Aha, a wave of ~1200 Bombers just spawned (Could have been the Raid Engine wave?). 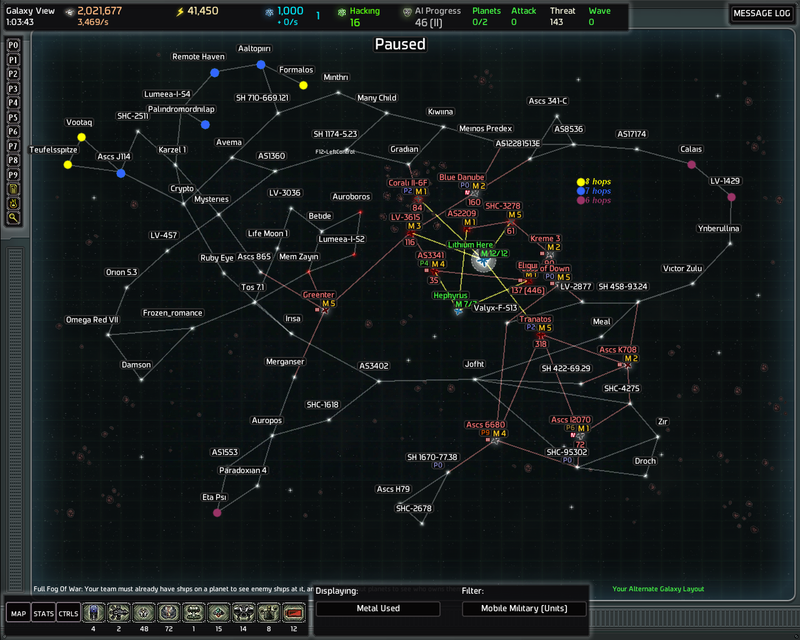 ~750 entered my homeworld. 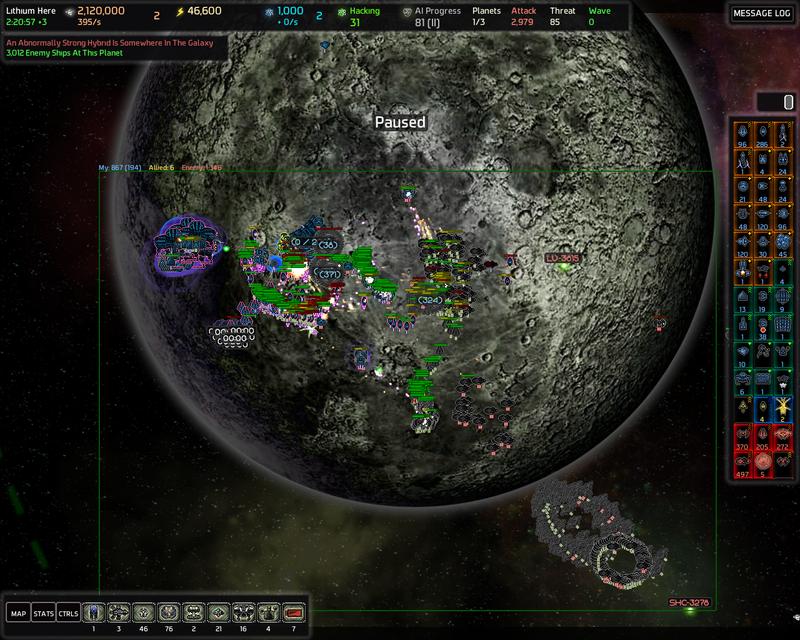 Theres 730 bombers left in this screenshot. Lets see how many seconds they last. 35 seconds. I appreciate your effort AI but you've got to step up your game. Can't wait till I get to ~130 AIP. Also the ZPG is now at 79%. BOOM! The ZPG is done! Now I can scrap all of my Matter Converters. 261900 Energy left after scrapping them. If I built all non flak non lightning damage dealing turrets on a beachhead it would use 189600 energy so can't afford all the beachheads all the turrets just yet. 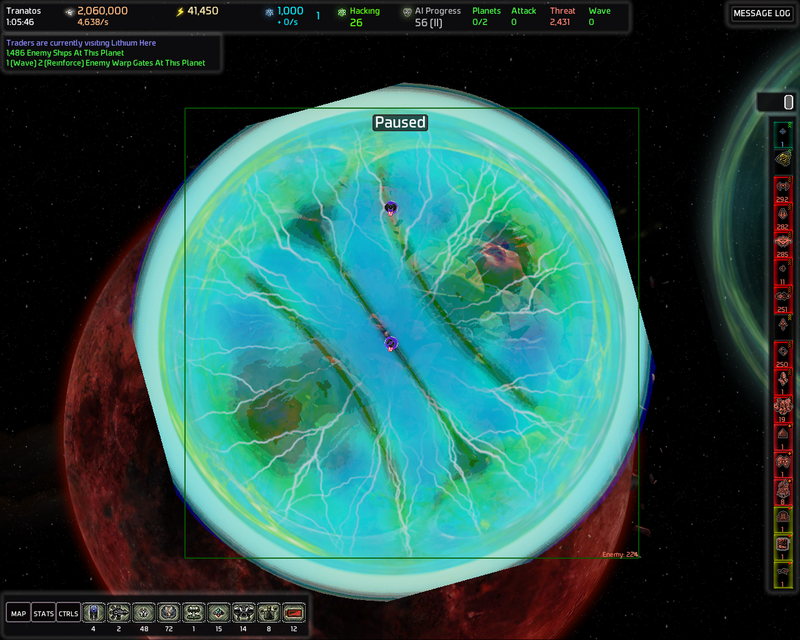 And now the OMDs on my homeworld (Lithium Here) and Hephyrus (the one with the fabs) are ready as well. So here's the plan. I'm going to build beachheads on the 2 green planets on this map. 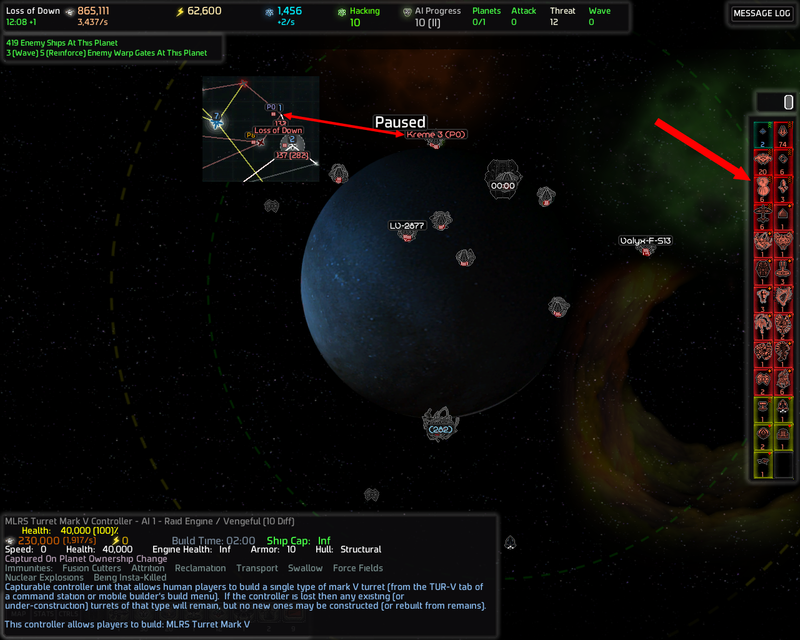 So both of the beachheads are setup to protect Hephyrus which has the two Fabricators. Can't afford to lose them. Since Hephyrus is going to be protected by beachheads in addition to it's own defenses I can split all the minefields between my homeworld and Tranatos. 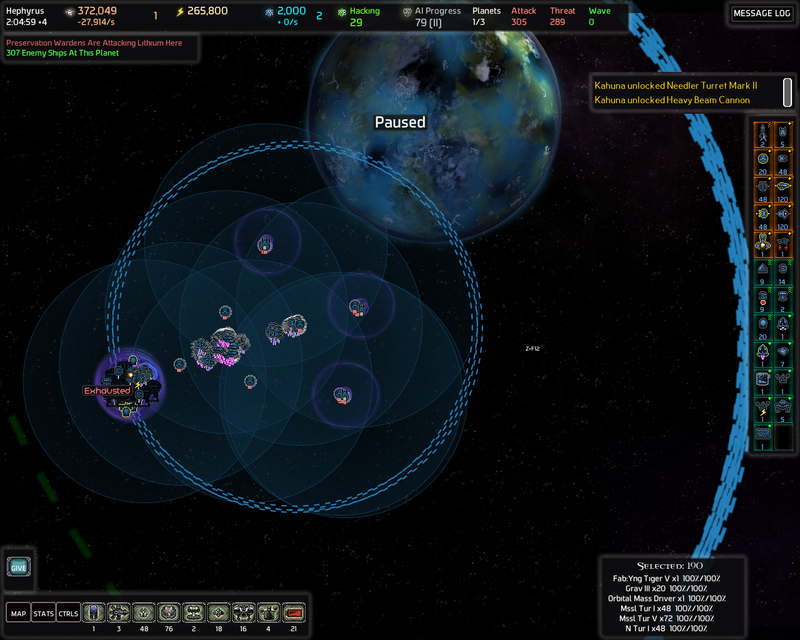 4 wormholes in total. Assuming the CPA is going to take the routes I marked. 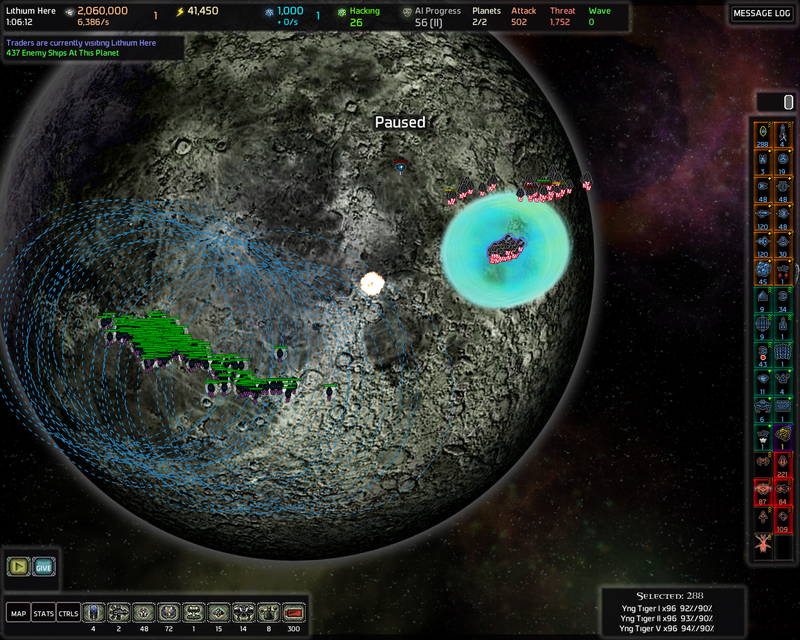 So each wormhole is going to have 3 lines of 24 Minefields. Loss of Down is in an excellent position so I might capture it a bit later. I don't think I'd make it before the CPA arrives so I'm going to leave it for now. It has a Raid Engine and some other nasties. Oh and the 6 EMP Guardians that killed me at the beginning because I was careless. 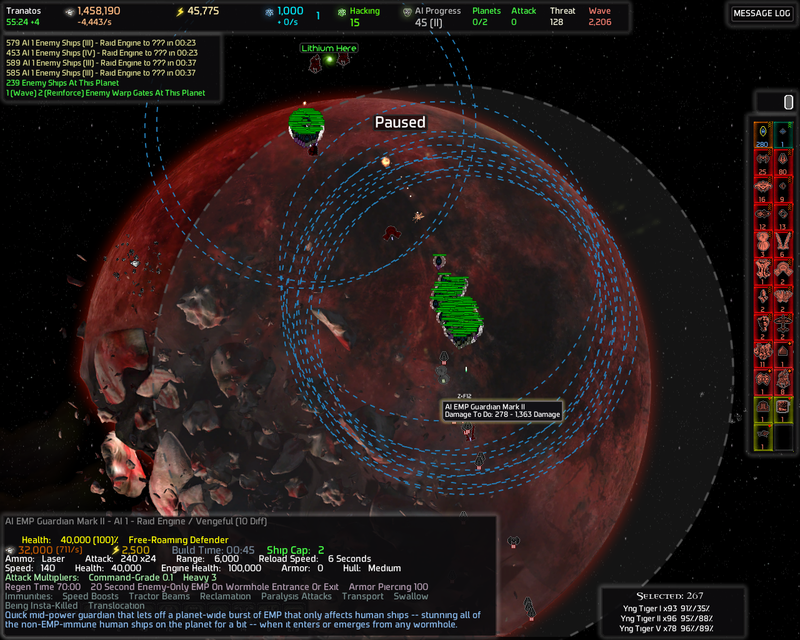 If I had Loss of Down it together with Tranatos would completely (hopefully) isolate my homeworld from the right side of the galaxy. 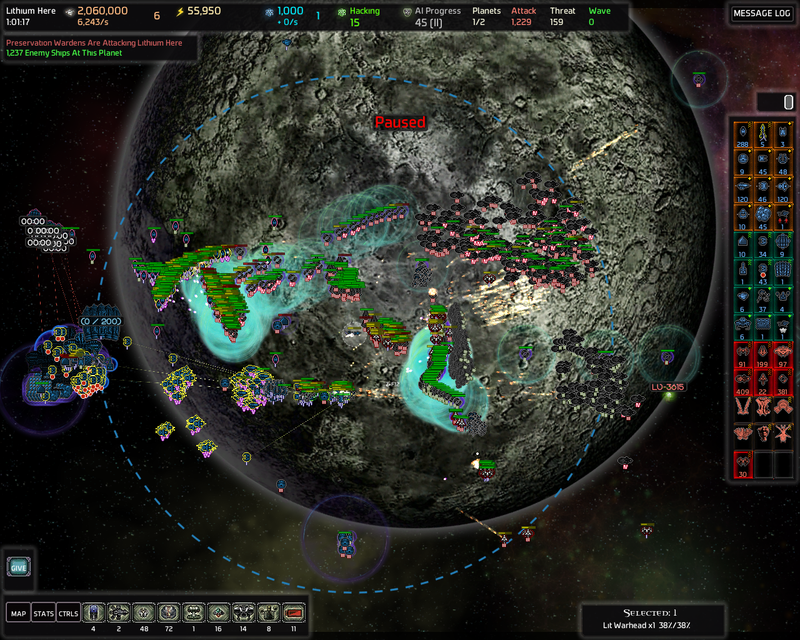 Then I could protect the left side with beachheads and Minefields on those wormholes. Yeah that sounds good. Going to do it after the first CPA has been repelled. Also I have 2000 knowledge left, hm. 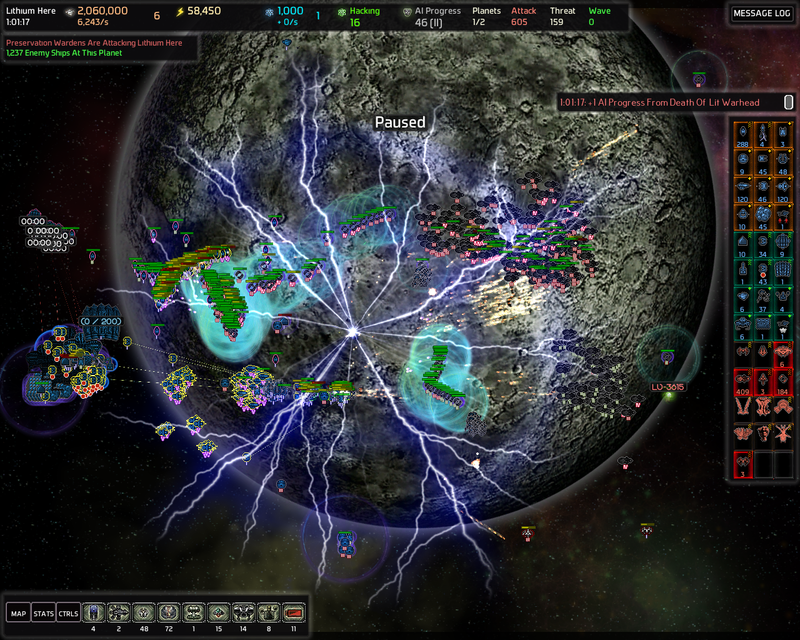 I could unlock Area Minefields but I could also go with Mark II Hardened Force Fields because of the style of defense I'm going with. They would buy more time for the Mil CS and long range turrets to do their job. 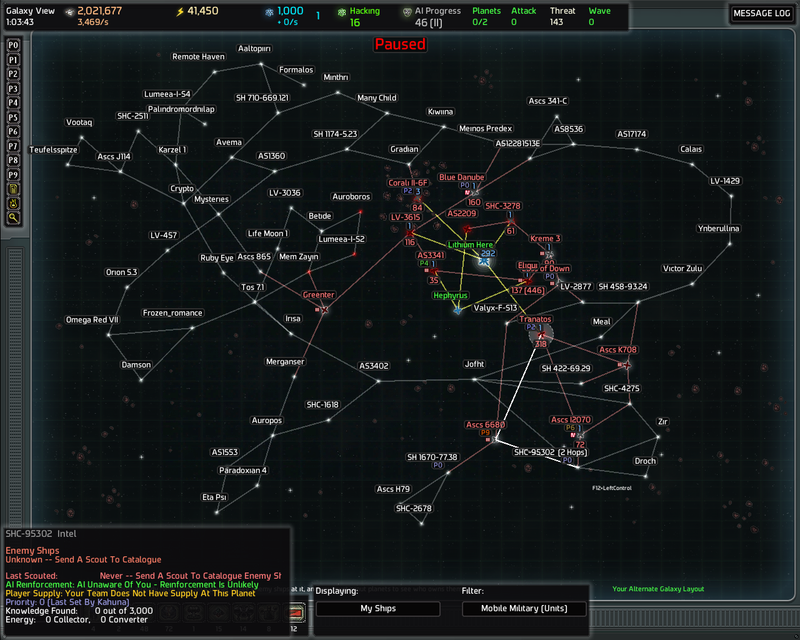 On the other hand I already have a lot of firepower to destroy Polycrystal (Bombers), Ultra-lights (Guardians), Medium (Guardians) and Composites (Spire Gravity Drains) but I think I'm lacking in firepower against Ultra-Heavy (Carriers). So I could unlock Mark II Needler Turrets (500 knowledge) and Mark I Heavy Beam Cannons (another 500 knowledge) to help beat up those Carriers. Since my homeworld and Hephyrus have the OMDs to counter the Carriers I could build all of the HBCs to Tranatos, which doesn't have an OMD. The Needler Turrets would also help me against Missile Turrets. Then I'd still have 1000 knowledge left. After I've captured Loss of Down I'll have 4000 knowledge. 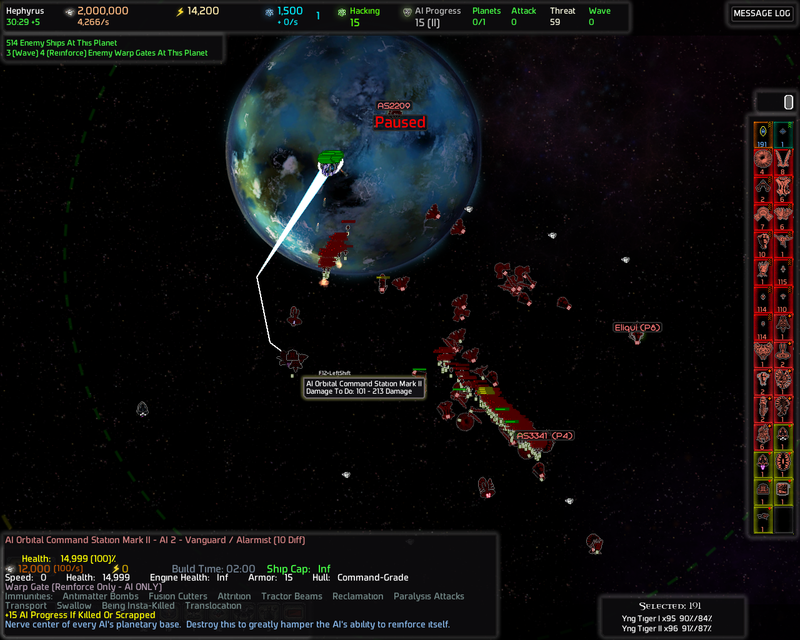 Then I could unlock Mark II Hardened Force Fields after which I'd have 2000 knowledge left. Then I'm probably going to capture the second ZPG (Droch) in the lower right corner after which I'd have 5000 knowledge.. which would be enough for Mark III Military Command Stations. Then imma capture the 2 planets adjacent to Droch (SHC-95302 and Zir) after which I'll have 6000 knowledge which is enough for Mark III Force Fields + Mark II Tractor Turrets + Mark I Spider Turrets (4000+750+1250=6000 knowledge). Yeah, that sounds like a plan! This seems like a good milestone to take a break. Things are coming together perfectly! Oh, no! 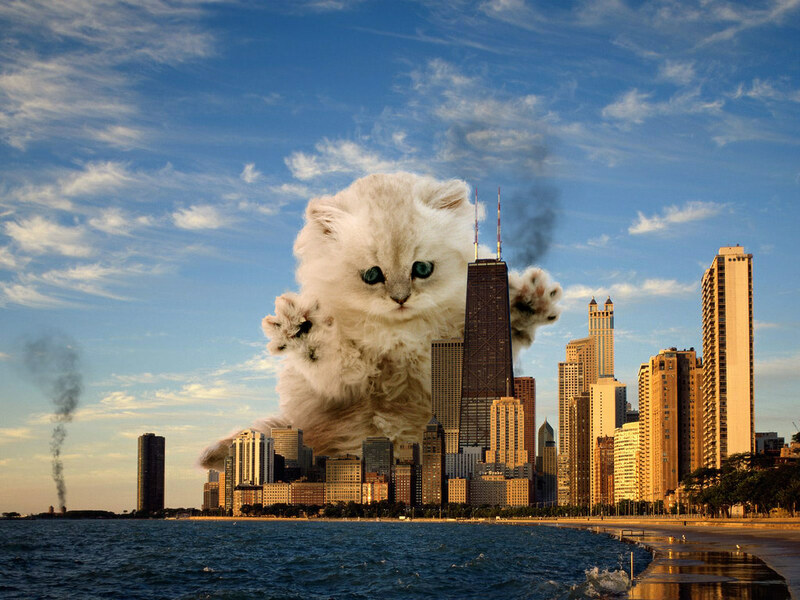 With shield bearers gone, can anything save a poor, defenseless AI from the rampaging SuperCat? Before you do a beachhead, how much metal are you saving up first? Full caps of those Mark V turrets alone cost 468000 metal. All of those turrets together cost 976800 metal. So with all of those turrets and assuming that you want to get it built ASAP before the AI gets in range, that's basically the minimum. In addition to that I'd most likely build a couple of Force Fields and Mark III Gravitational Turrets as well. Lets say building those turrets takes 30 seconds and your metal income is +2000/s at the beginning. The cost is kind of reduced to 976800-30*2000=916800 which is insignificant. 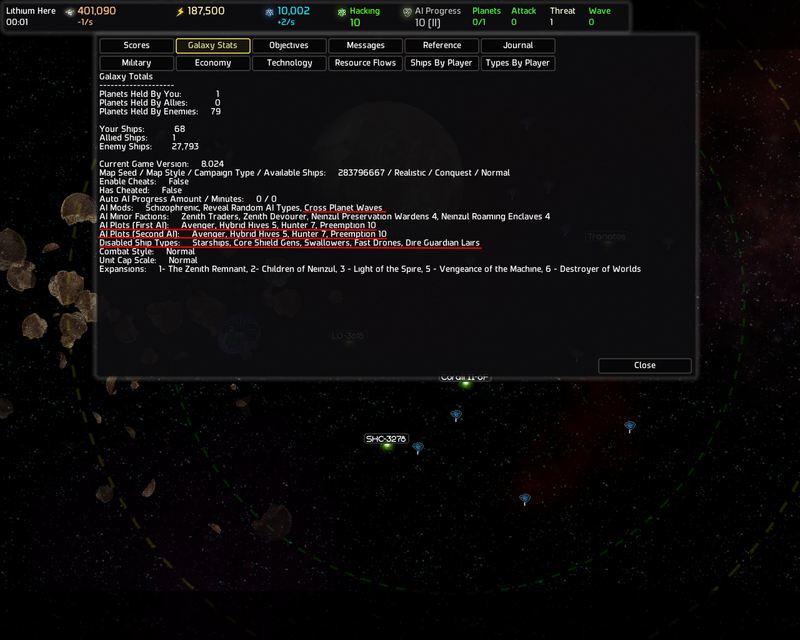 How ever if you have a good amount (+8000/s) of income from salvage for example, the cost "reduced" down to 736800. So if you can use that to your advantage. Salvage tends to top off the metal storage quite effectively after which the metal is wasted. 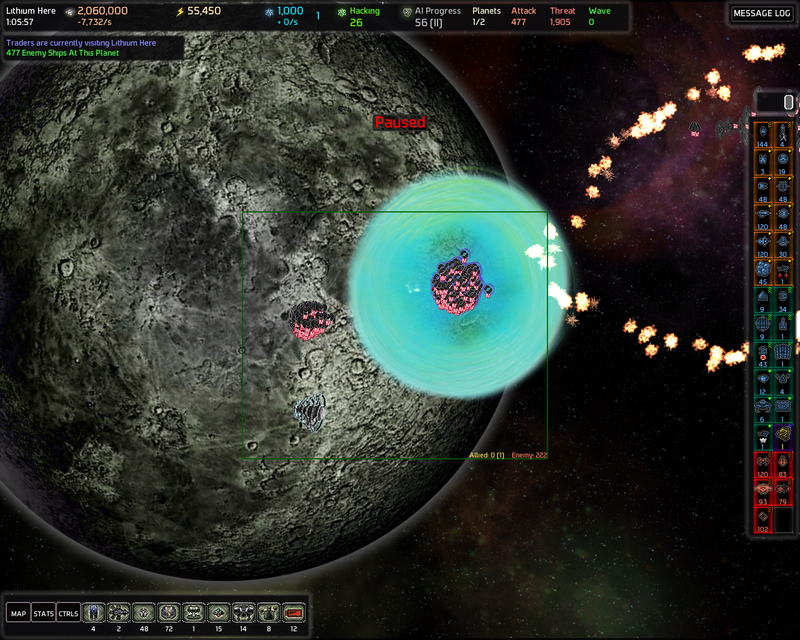 Also have to take into account that you should be able to repair and rebuild the damaged and destroyed turrets. But that cost is mostly handled simply by a healthy metal income/s. The energy cost of all of those turrets would be 208000 which is roughly 4 Matter Converters which is -800 metal/s which is -24000 metal in that 30 seconds. Quite insignificant. -800/s can still add up over the course of hours. It's worth pointing out that all mark levels of the same turret cost as much metal and energy. So higher mark level turrets provide significantly more bang per buck. It definitely sounds like this one is going better for you, even with the annoying shield bearers which at least are gone now. I'm assuming the REs are supposed to be more of a threat, but your defenses just work very well against them? I don't think I've ever played with REs enabled, so their purpose is somewhat lost on me. Starting a new campaign, going to try a few of these techniques. Always informative, thanks Kahuna. 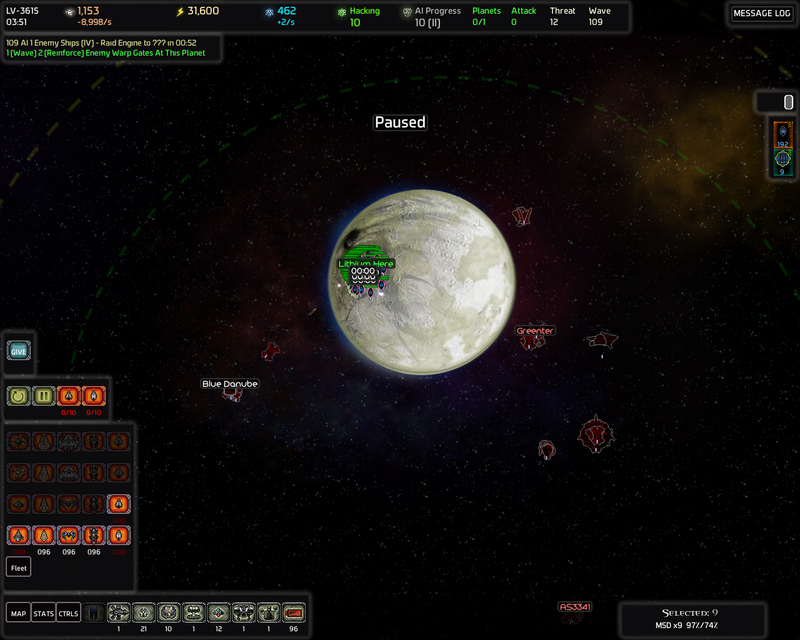 Oookk so I need to beachhead those two planets now. Gonna send some scouts to them.. ..WHAT?! Shield Bearers again? 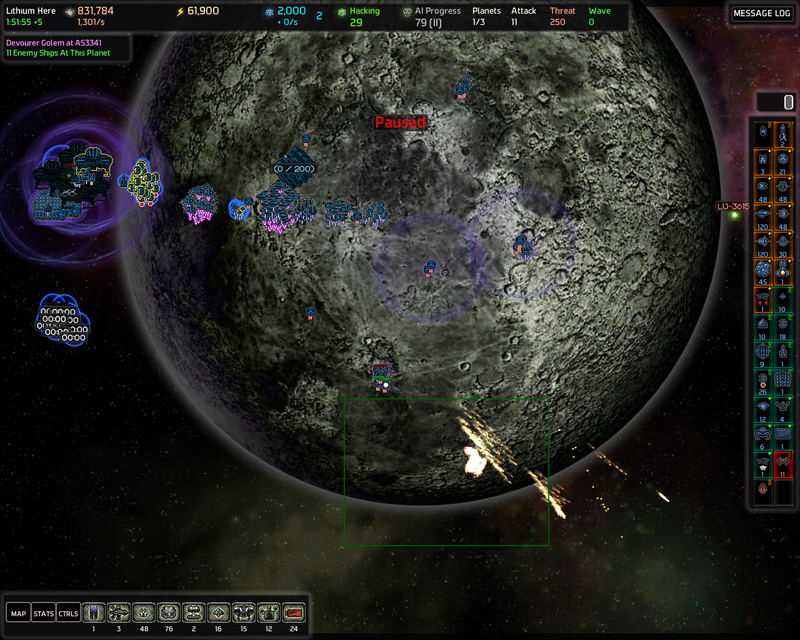 Oh and the Tachyon Microfighters detected my MSDs which got obliterated shortly after.. ..I'll be right back, gonna make some coffee.. Need to change the plan a little bit. And now that I've thought about this a bit more. To effectively delay and soften up the CPAs with beachheads I'd need more Needler and Laser Turrets to counter the Carriers. And Spider Turrets would be great against any free AI ships. Including Shield Bearers. I just checked Shield Bearer's stats and all Mark levels of them have 100 Engine Health. So in addition to ordering the Mil CS to focus on them I could also focus them with Spider Turrets. 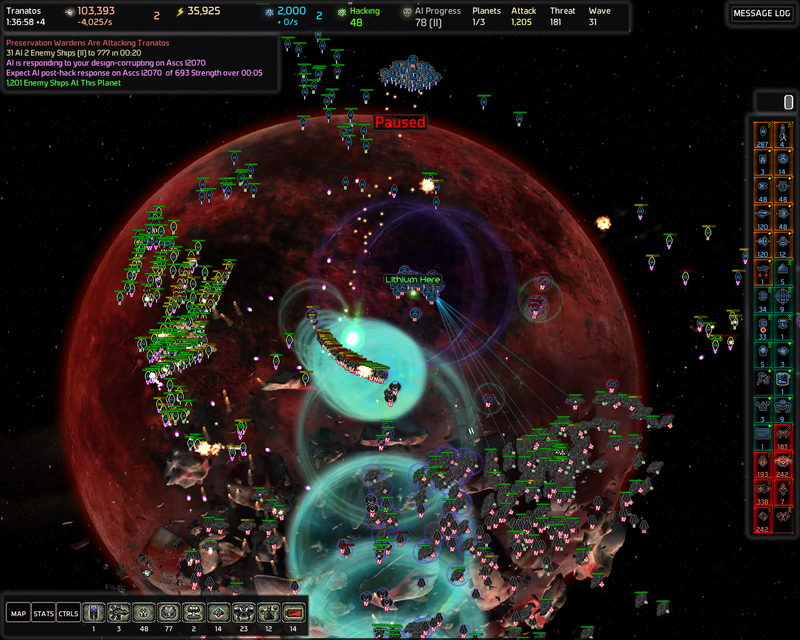 Disabling a few dozen Mark IV Shield Bearers would have a significant impact. Also I forgot that Eliqui is basically invulnerable without the use of Warheads so I guess I have to give up on these beachheads this time. 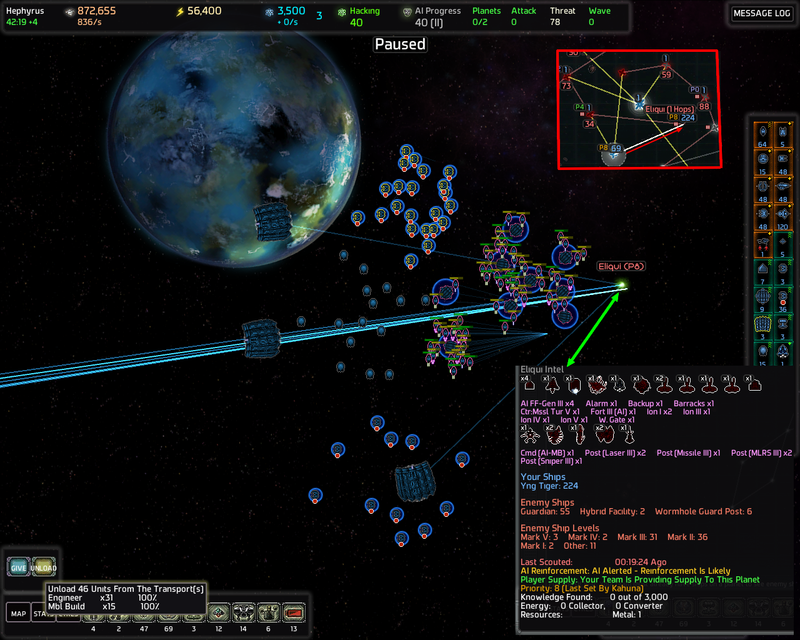 4 Mark III AI Force Fields, 5 Ion Cannons, Sniper Guard Post + others and a Munitions CS. Going to save up the metal instead of spending it on beachheads and grinding that kind of defenses. I think I'm going to just destroy Loss of Down without capturing it and get the knowledge for Mark III Military Command Stations before the CPA..
..And speaking of the CPA is has now been announced so I definitely wouldn't have had time to build those beachheads. 8425 ships incoming and it's certainly going to have a lot of Shield Bearers.. and I'm going to have a lot of Lightning Warheads..
Oh that's right. Loss of Down had those 6 EMP Guardians. Going to move MSDs to AS2209 so the MSDs don't get EMPd when the EMP Guardians go through SHC-3278. 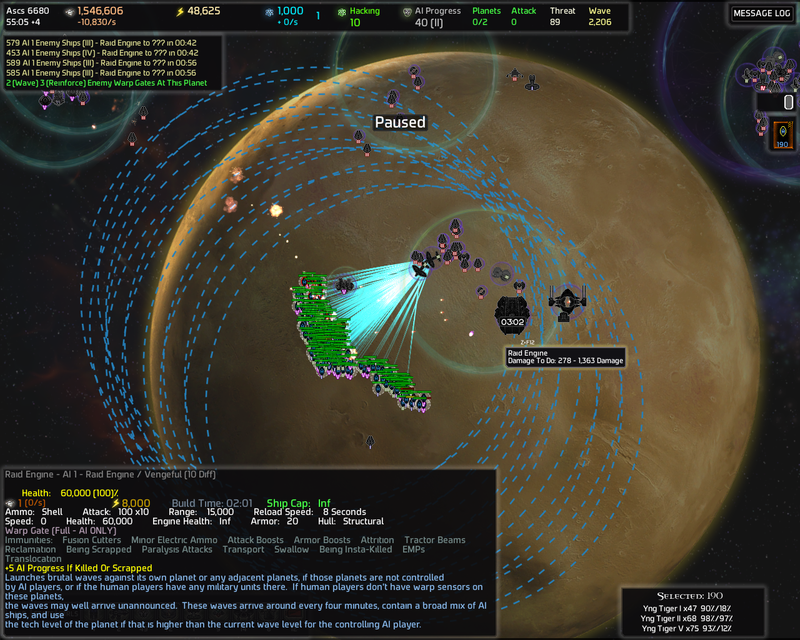 I can also send NTigers from AS2209 to SHC-3278 to ambush the EMP Guardians before they get to my homeworld. In theory. And apparently the Raid Engine wave is already knocking on my door. Didn't even pay attention to the warning. The ambush worked but apparently there were free EMP Guardians on LV-3615 too. Great. Now the EMP Guardians seem to have calmed down so I'm going to bring in the MSDs..
..You've GOT to be kidding me. 1Mark III H/K, 1 Mark II H/K and 2 Mark I H/Ks and dozens of Missile Guardians. Ok forget it. I'm just going do it after the CPA has been repelled and Warhead all the threat. If the AI doesn't have any sense of humor I'm not going to have either. 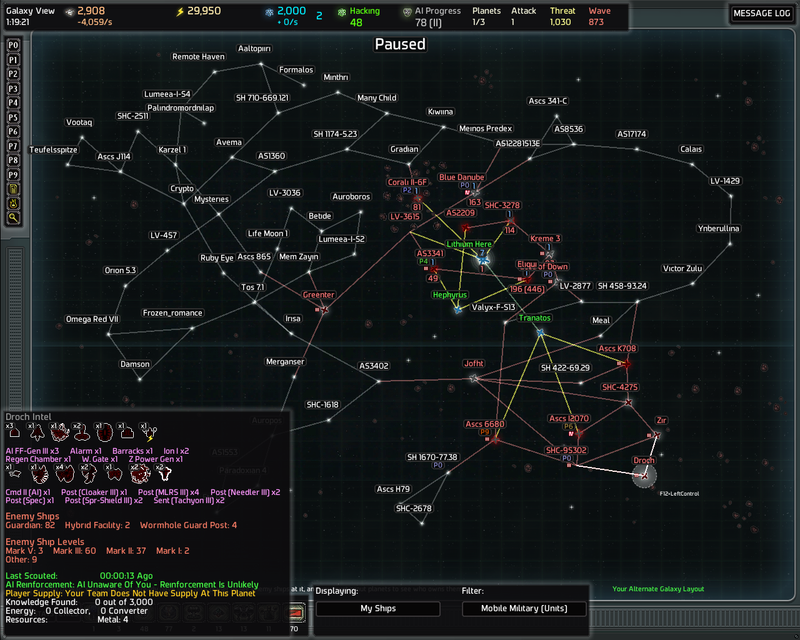 Gonna Warhead everything..
..And literally one second after this the Raid Engine wave spawned on top of Loss of Down's wormhole..
..Aaaannd now I got a reprisal wave for spamming the NTigers a bit too much. Yeah this is going really smoothly. 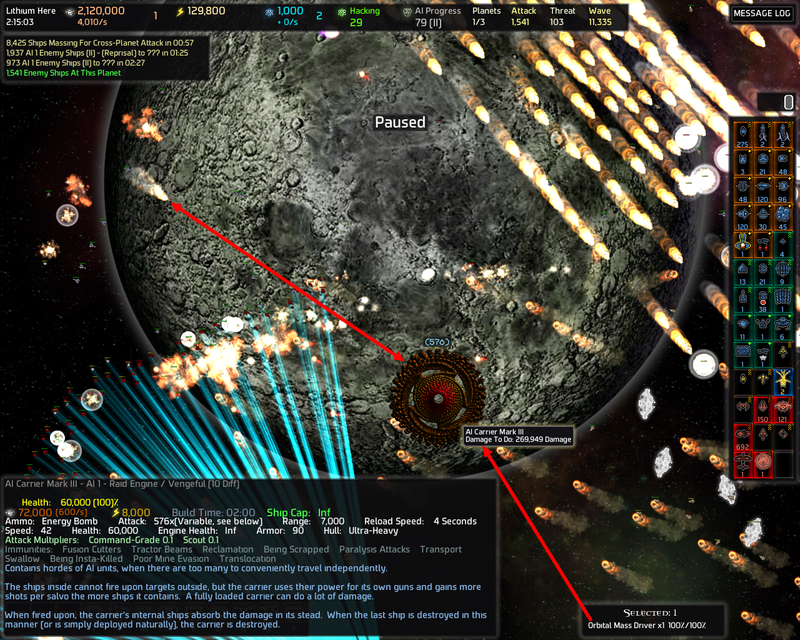 Destroyed 56 ships inside in one hit. That's pretty good. It depends heavily on what ships are inside the Carrier. 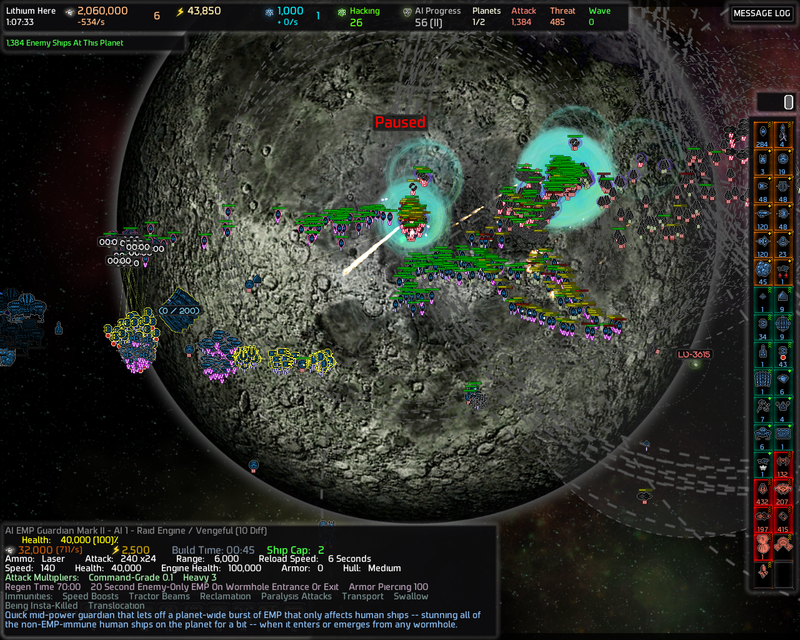 Think swarmers cap health vs starships cap health. 269946/56=4820,46.. so it was probably a mix of Mark III Fighters and Mark III Bombers or Missile Frigates. Hahaha the Special Forces have now gathered on Loss of Down. Hunter/Killers and hundreds of Guardians. 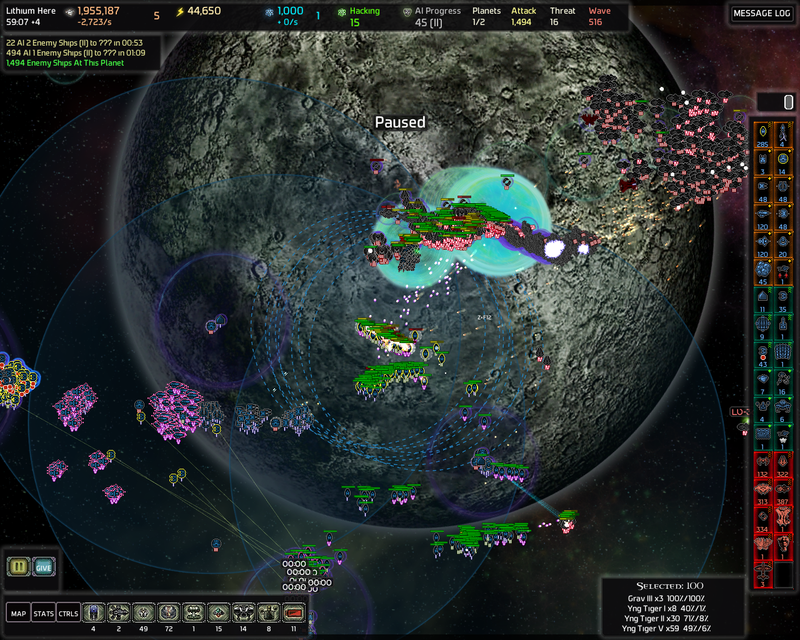 218 Missile Guardians of which 100 are Mark V. And most of those Mark III Tractor Guardians are camping on top of that wormhole. I'll have to sneak in with the MSDs and then start spamming the NTigers to get rid of the RE and the CS. Good thing they're not threat. Speaking of threat the CPA has spawned. This is going to be a wild ride. I've already used one Mark II Lightning Warhead. I have one Mark I Lightning Warhead ready to be popped but I might not have to use it. 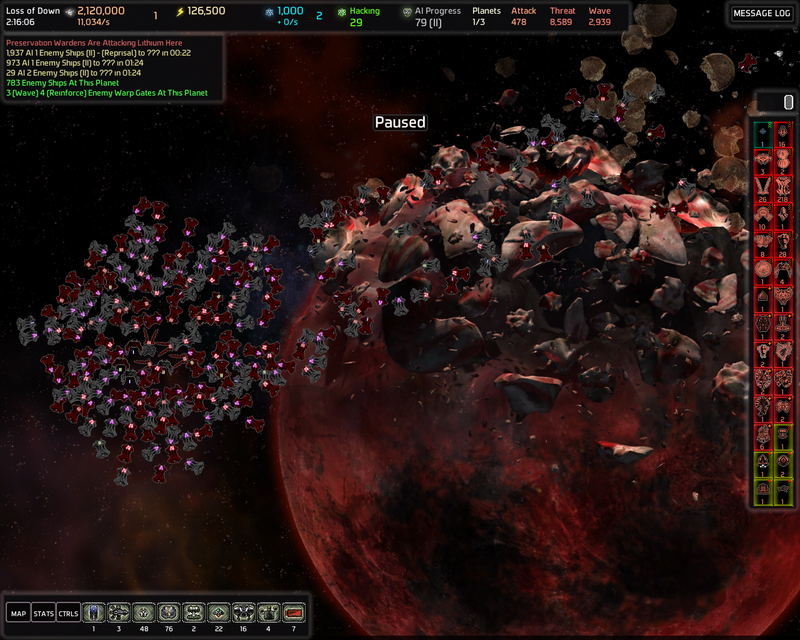 Luckily there were a TON of AI Bombers which are quite fragile. The Sniper and Missile Turrets and MSDs spamming Fighters made the AI Bombers drop like flies even though there were thousands of them. And more has just arrived. The OMD combined with the Gravitational, Needler and Laser Turrets and the Mil CS has proven to be an extremely effective combination yet again. Too bad the OMD is immune to attack boosts but it's still very effective. Would probably be straight OP if it wasn't. Luckily there was only a couple of Shield Bearers. They must have been left overs after the sabotage. 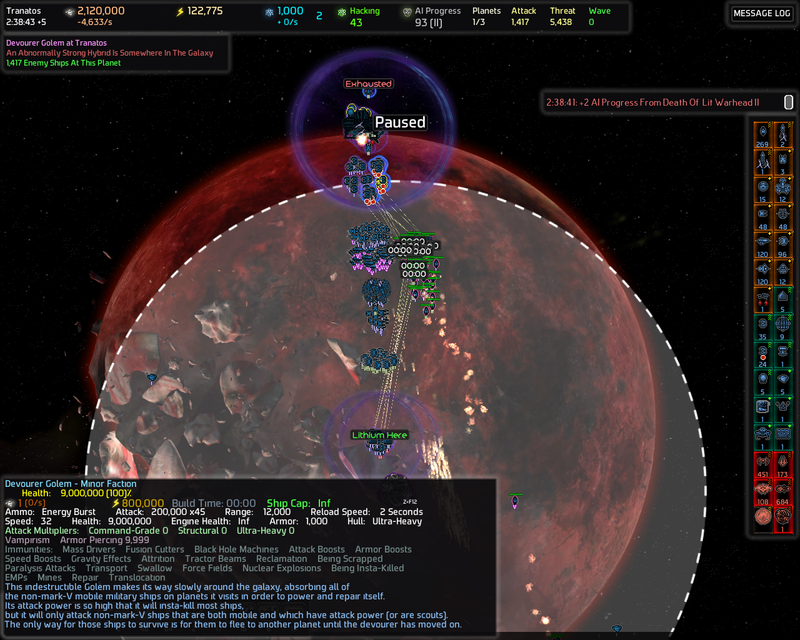 Perhaps the AI had some Shield Bearers as guards which were freed by Preemptive plot or the CPA..
..And literally after writing that^^ and going back to the game and unpausing the game for 1 second the last Carrier unloads 58 Shield Bearers. Still it's only 58 and they're Mark I. Oh AI u so funny. The CPA has been repelled. That honestly surprisingly easy. I only had to use one Mark II Warhead. 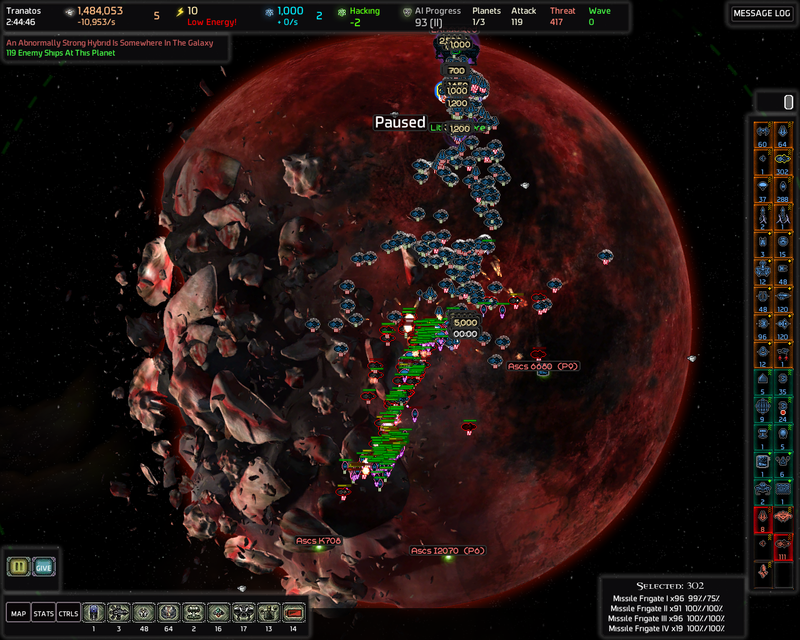 Vast majority of it hit my homeworld. 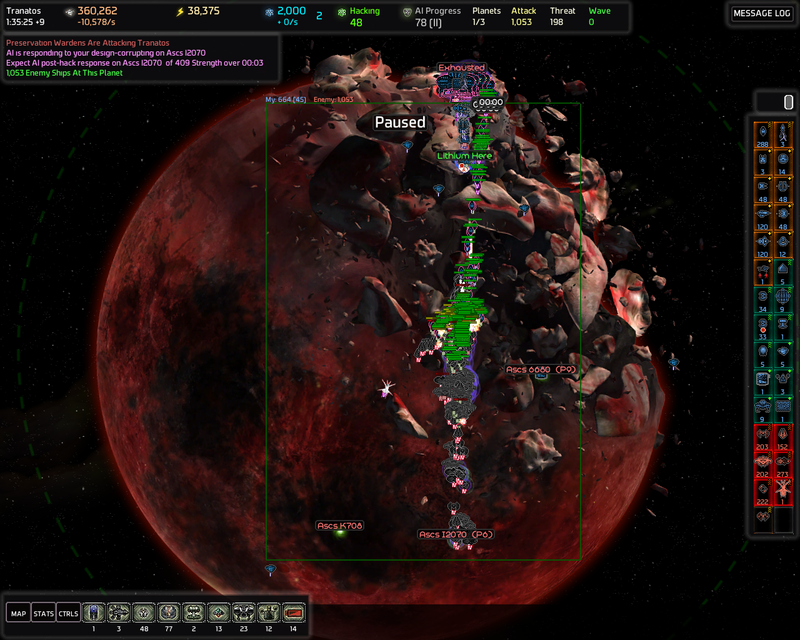 Also built a beachhead on LV-3615 which was strong enough to stop a (cross planetary (threat)) wave with the help of some NTigers and rebuilders. Now I'm doing some Raid Engine raiding while hacking me some Core Doom Shrooms. And while I'm out there destroying some Raid Engines I also destroy all the Tachyon Guardians on the way so I can expand my vision. 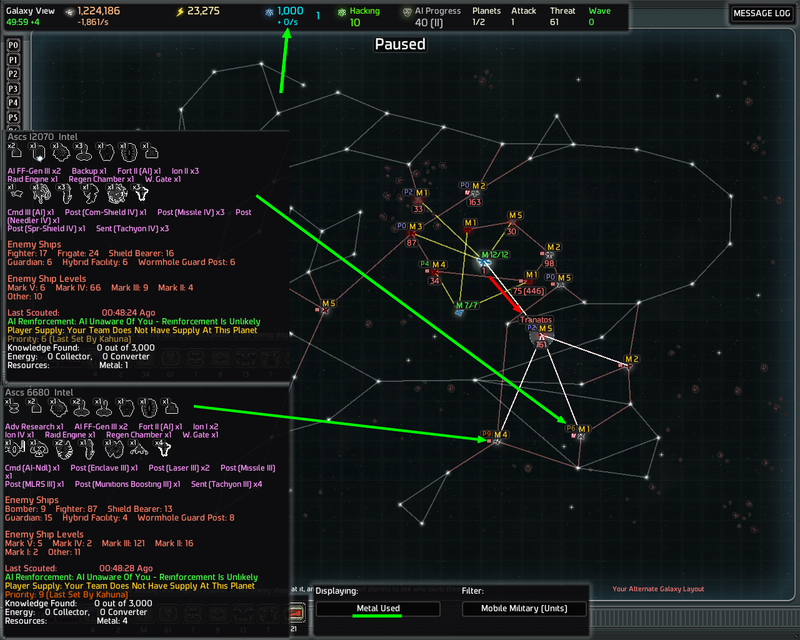 Managed to destroy 3 Raid Engines in lower part of the galaxy in one go and got myself another "CPA". Am also trying to speed up the game a little bit. Oh my lord.. I didn't notice the warning about the Cookie Monster (Zenith Devourer) and I didn't hide my Warheads. 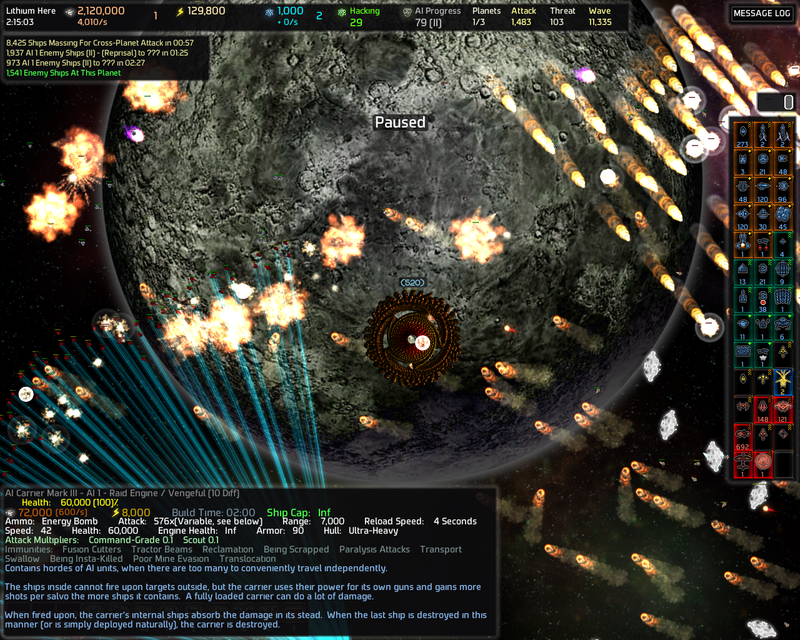 So it destroyed one of the Mark II Lightning Warheads.... argh. The AIP is now 93. 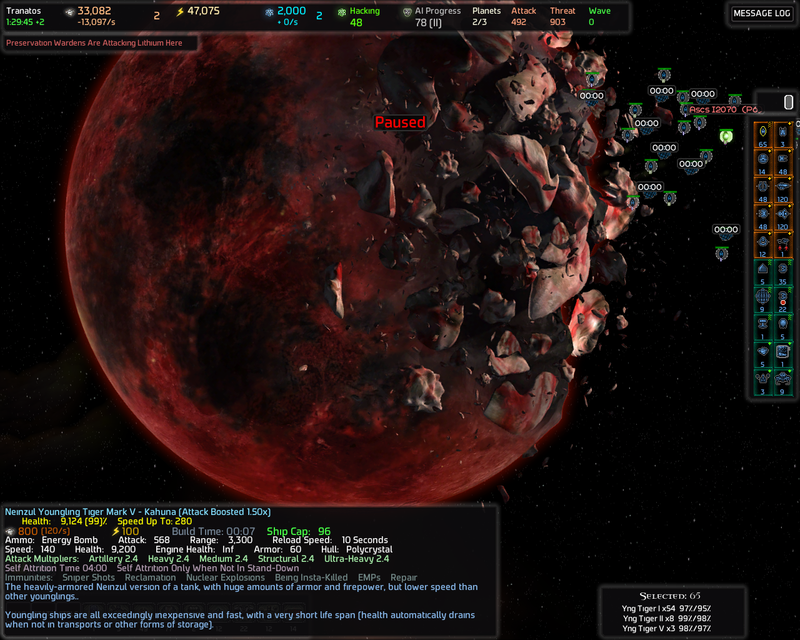 Oh well at least it's going to help me clean up those AI ships. And thankfully it wasn't particularly hungry this time so it didn't go after the rest of the Warheads. Yes it does that sometimes. The rest of the threat (Raid Engine waves) are heading to the same planet as the Cookie Monster. Lets see how fast the threat drops. 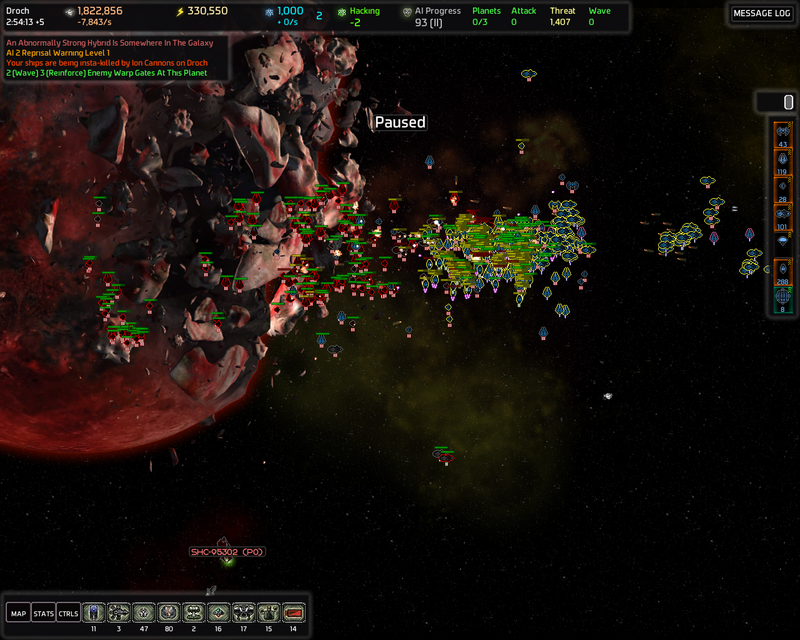 2106 ships destroyed in about 1 minute of which probably a significant portion was destroyed by my defenses. Not worth the +2 AIP from the death of the Warhead. 40 seconds of hacking left. 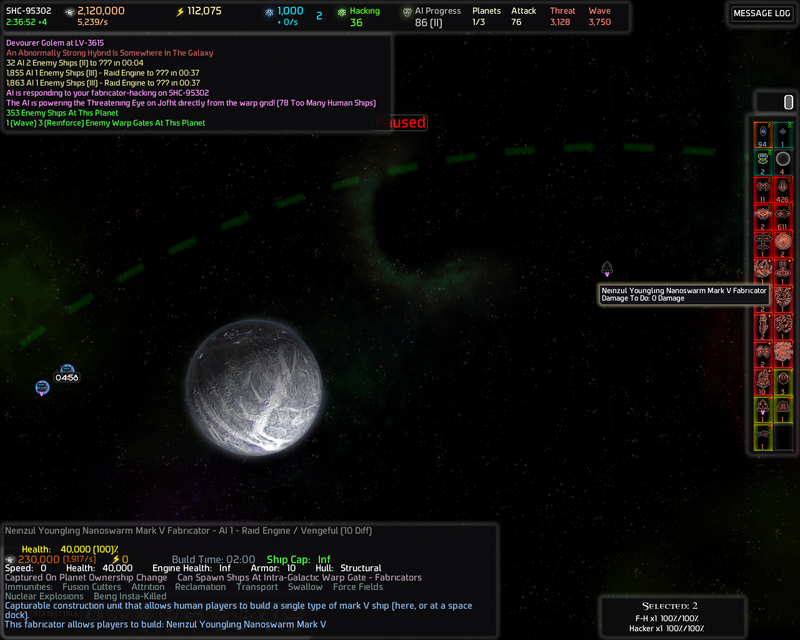 The AI just blanketed the planet with tachyon..
..Aaand the hack was successful. Time to start spamming the Doom Shroom to get out of this situation without having to pop (or to let be popped) another warhead. And suddenly I have 37 Mark IV Missile Frigates, 96 Mark III Missile Frigates and 96 Mark II Missile Frigates (few seconds after the screenshot). Got some Bombers and Fighters too but I'm more interested in these Missile Frigates because they're better for defense because of their long range. 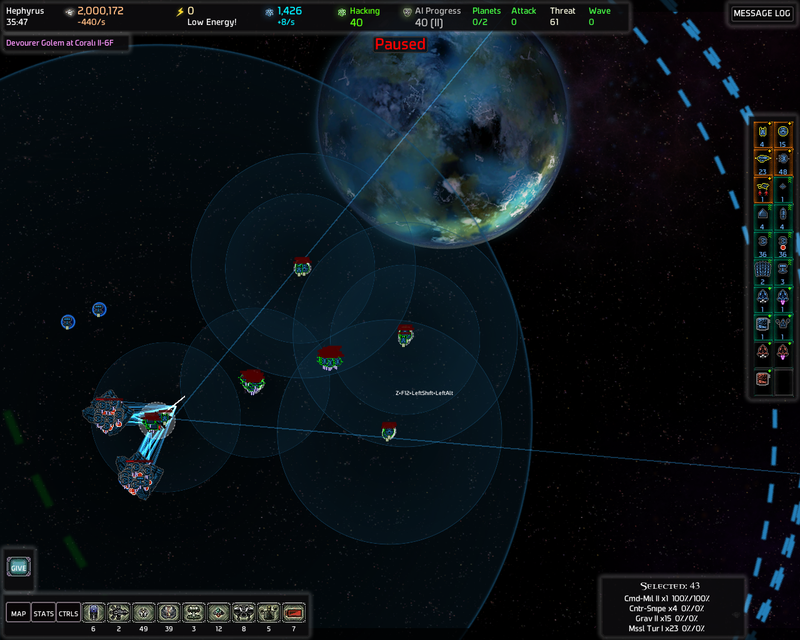 They can sit next to my turrets, enjoy the attack boost from the Mil CS and out range the attacking AI ships that are delayed by Gravitational Turrets. 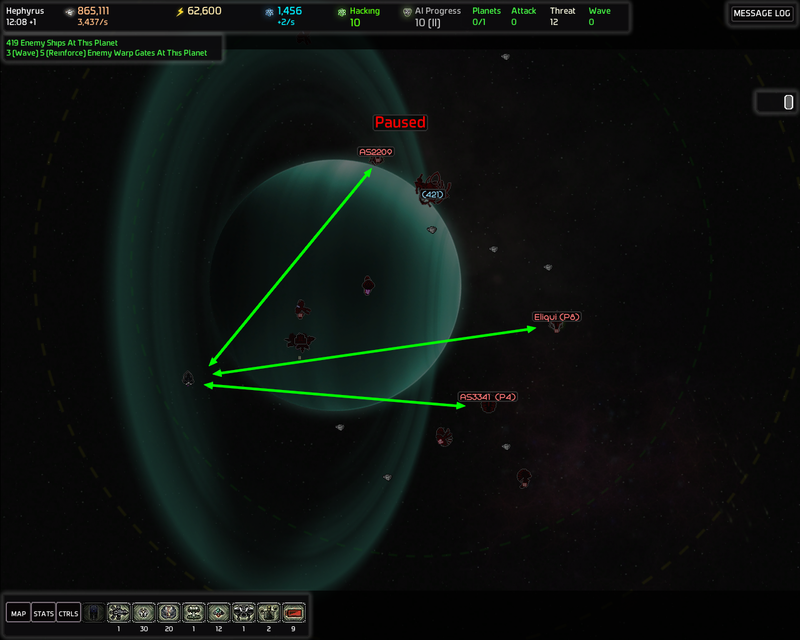 I went to clear my way to Droch (the planet in the lower right corner of the galaxy with the ZPG) and destroyed quite a few Guardposts on my way which made the Raid Engine / Vengeful reeaally angry so it sent some exos to my homeworld. The OMD shredded the Spirecraft Shields to pieces and even though the Implosion Guardian did a lot of damage to my Force Fields they were soon recycled as salvage thanks to the Sniper and Missile Turrets. Did someone somewhere talk about achieving superiority in firepower on high difficulty level? Got a reprisal wave of 76 Guardians. How cute. Getting ready to get myself another +600000 energy. 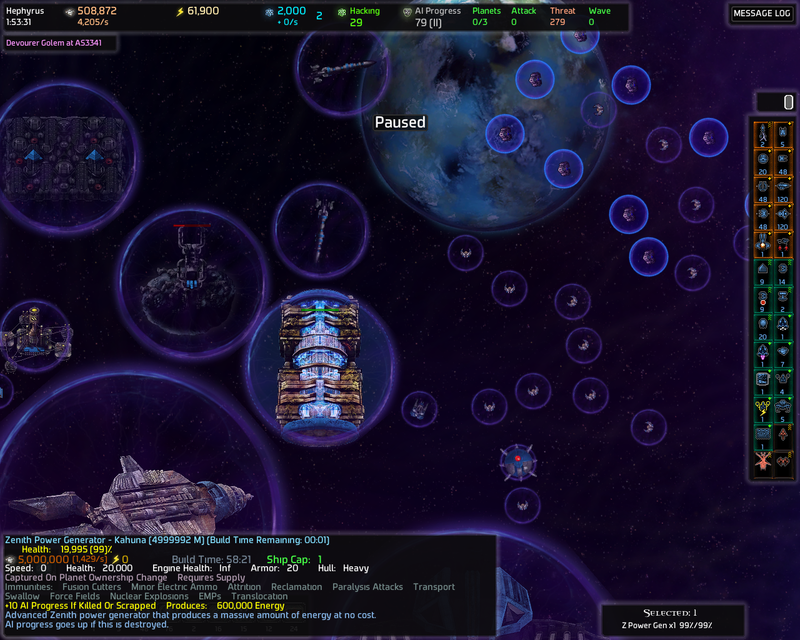 NTigers and reclaimed ships are keeping the AI busy while my Transports fly to Droch. Too bad I remembered incorrectly and Mark III Command Stations cost 5000 knowledge (!) 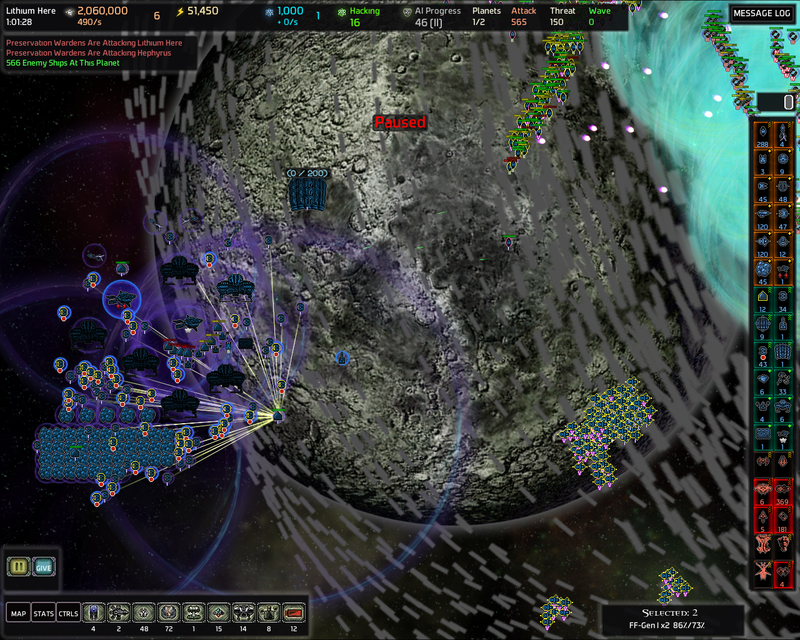 so I unlocked Mark III Hardened Force Fields instead. Time to take a break. Some good progress was made again. It definitely sounds like this one is going better for you, even with the annoying shield bearers which at least are gone now. Yeah things are definitely going very smoothly this time despite of the Shield Bearers. Although I'm only now starting to approach the point where I started the last AAR which is the 3 hour mark. AIP is 118 so soon things are probably going to get a bit more hairy. I'm assuming the REs are supposed to be more of a threat, but your defenses just work very well against them? Yes exactly. 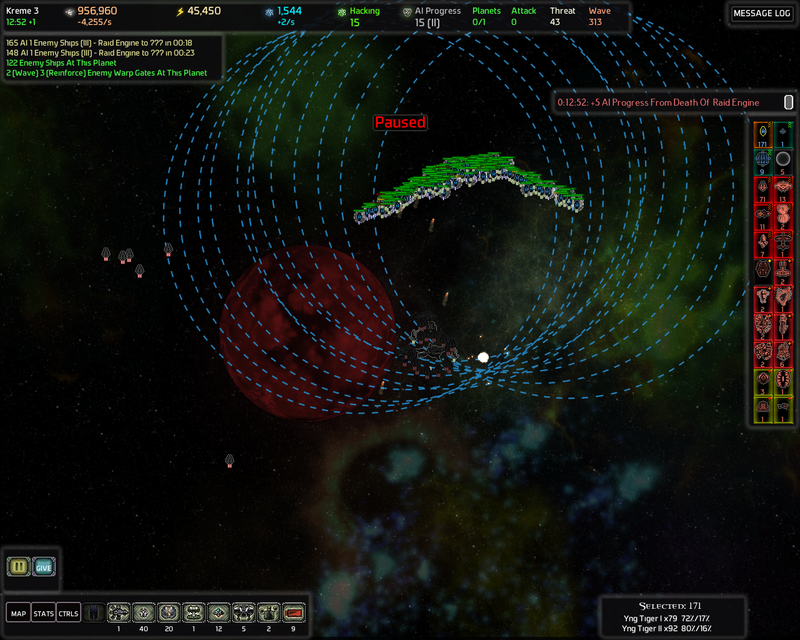 At the moment my defenses can easily automatically stop a few thousand AI ships and a single Raid Engine wave (or a wave) is still a bit less than 2000 ships so it's nothing to worry about. When waves get to ~3000 and they start having Carriers, that's when things start to get difficult. 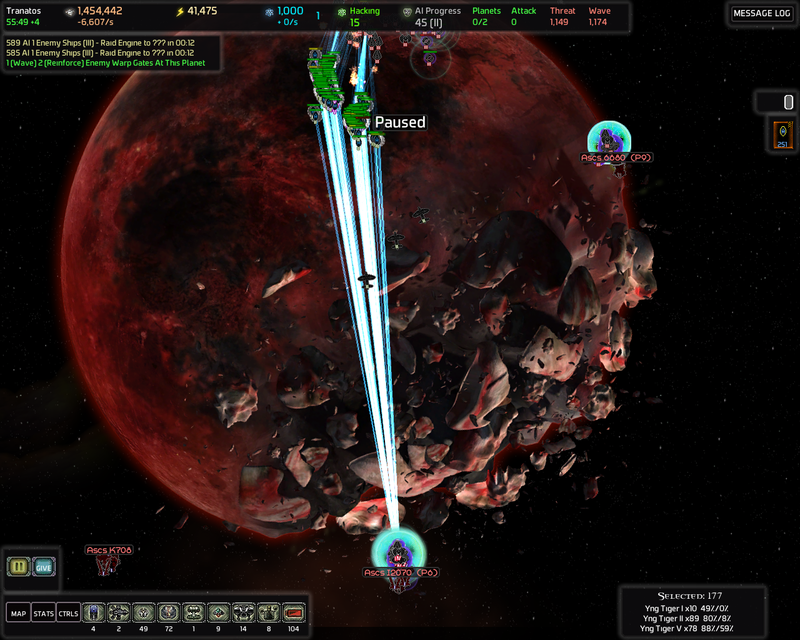 Raid Engines are especially dangerous at the beginning of the game and at the end. Mid game they're not a big deal if you have managed to get good defensive positions. 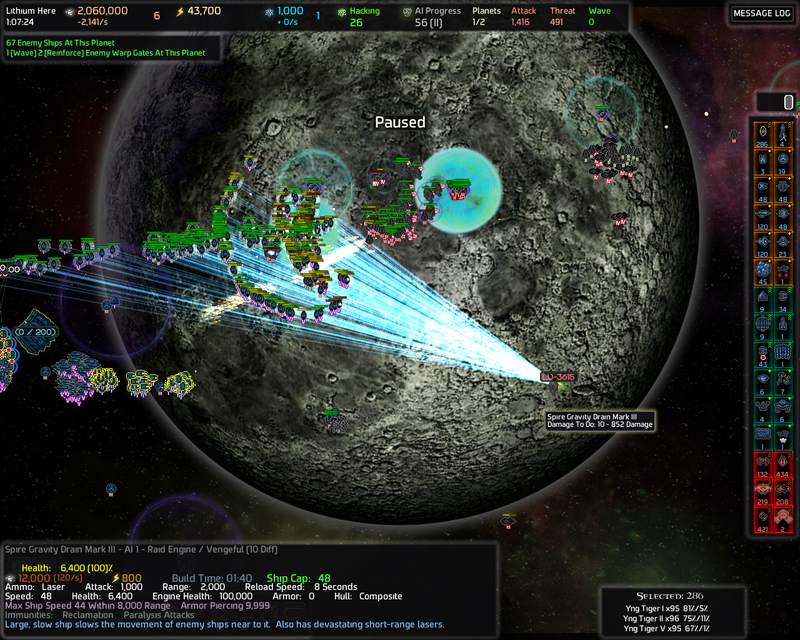 Early game they're dangerous because you don't have the turrets, energy and the knowledge to have enough firepower to safely stop multiple Raid Engine waves. 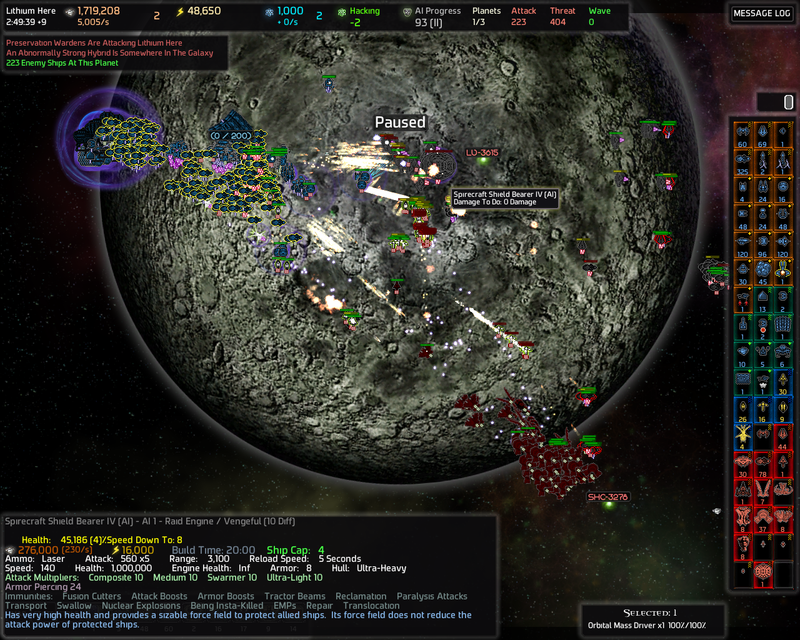 End game they're dangerous because a single Raid Engine wave can be thousands of ships. 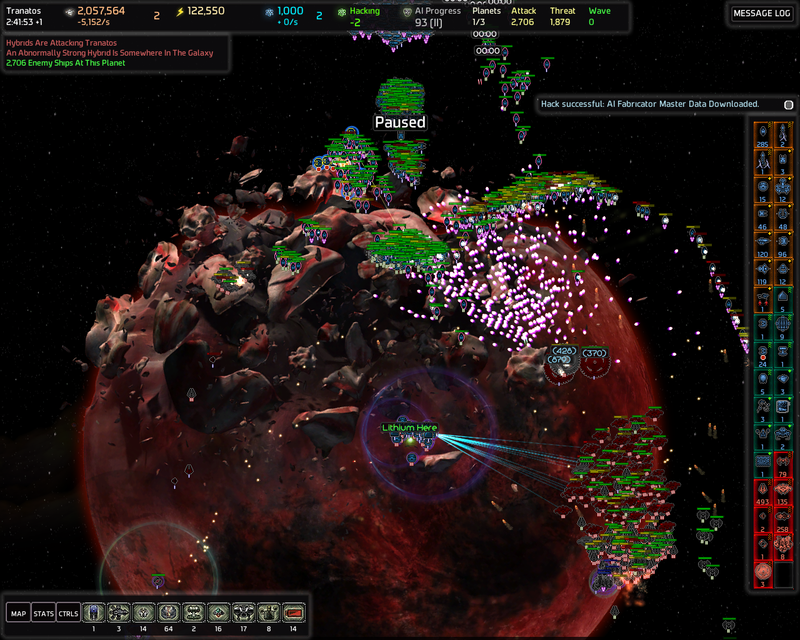 Imagine triggering 3 Raid Engines when each sends a wave of 8000 ships. 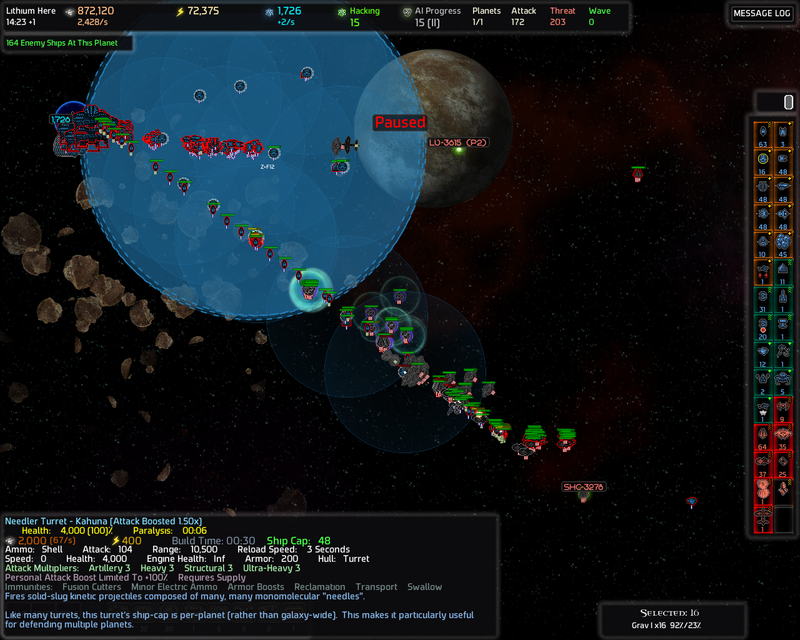 That's like a mini CPA of 24000 ships (Yes mini CPA since end game CPAs usually have ~40000 ships). You don't cycle up your turrets do you? 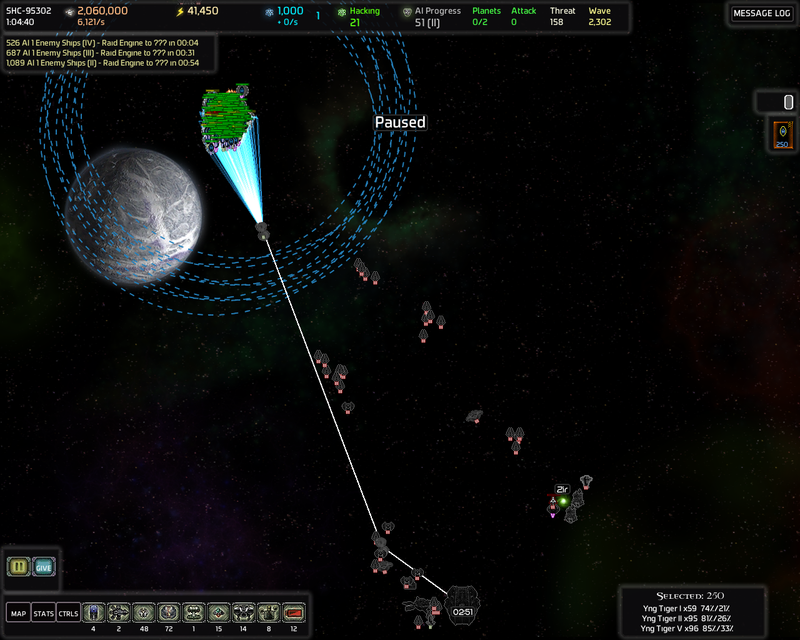 like your defensive design that is in your strategy thread as you unlock higher and higher levels of missile/laser/etc turrets they are just being added to your overall defense correct? (With the except of probably the global cap turrets like tractors, and such) so once you've unlocked mk II missiles for example, you'd fullcap mk1 and 2 on your systems?